This morning we left the Sandfire roadhouse in the cold and rain, with a forbidding black sky behind and a clearing sky ahead. We turned on the bus heater for perhaps the second time ever and drove the flat plains to Broome. As we approached Broome, the clouds began to thin and we even saw a few rays of sunshine. 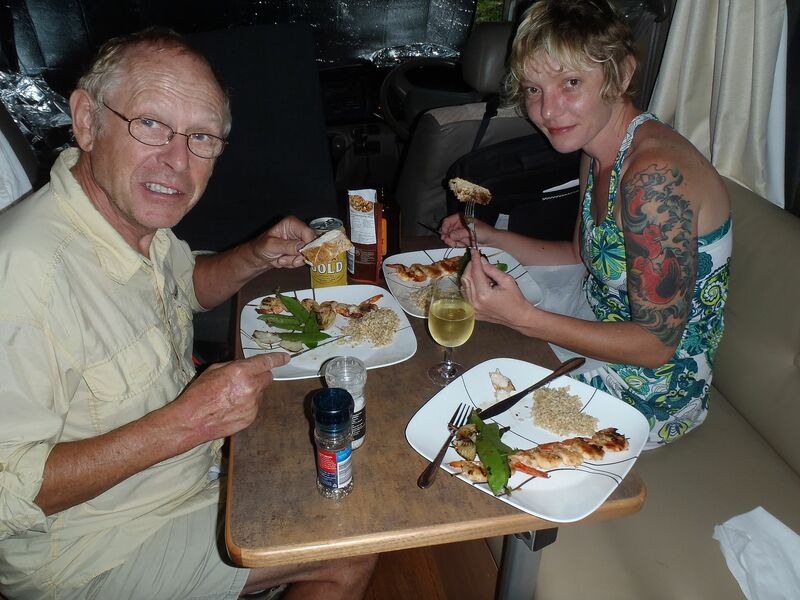 We have a dinner date this evening with Darrel and Liz who are still camping at the Cable Beach Caravan park. Liz doesn’t drink alcohol so we instantly nominated her as our designated driver for the evening. The restaurant we ate at was “BYO” which is Australian for “BYOB”. After we ordered, I slipped across the road to pick up some beer from the bottle shop directly opposite the restaurant. We were surprised to learn that although the restaurant does not have a license to sell alcoholic beverages, it nevertheless pays the government for a license to enable its customers to imbibe their own alcohol on the premises. Today was a “down” day. The clouds followed us from the west producing overcast skies and threatening rain but nevertheless we stayed dry. Annette caught up on her laundry whilst I manage to check the tire pressures. We have driven the bus almost 20,000 kilometers since we bought it and it will need another oil change soon. 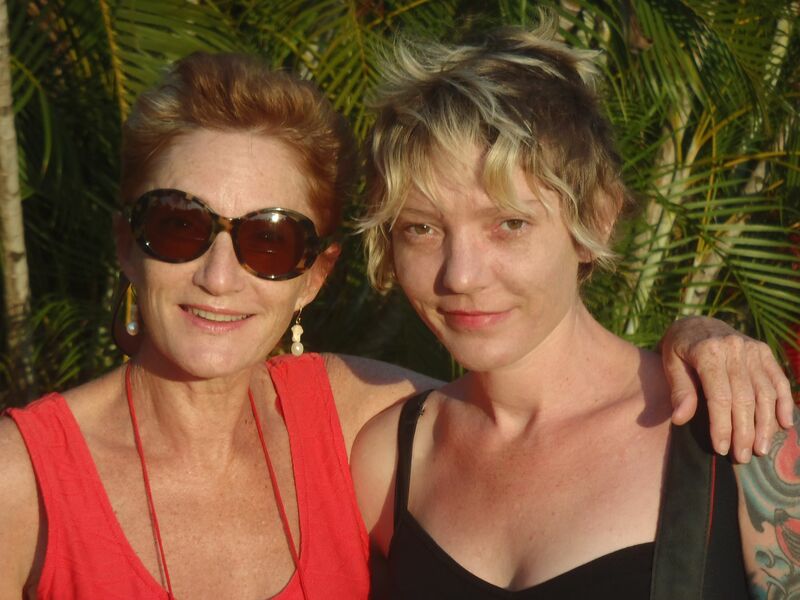 The big news of the day was that daughter Marian has worked out that she can visit us in Australia. She has a complicated and busy schedule but the bottom line is that she flies into Darwin next Monday. We set off this morning for Darwin and immediately regretted using the heater on the previous leg. The front bus heater is now leaking radiator fluid into the passenger wheel-well, probably from the temperature adjusting valve. Annoying but not fatal. We will top up the radiator and fix this later. 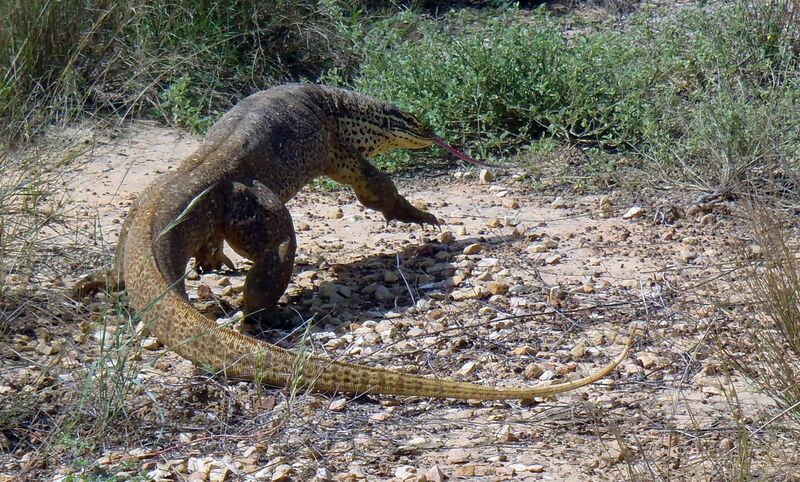 We headed east and most exciting part of the drive was passing a very large monitor lizard on the side of the road. I braked to a halt and then reversed about 80 yards along the side of the road. 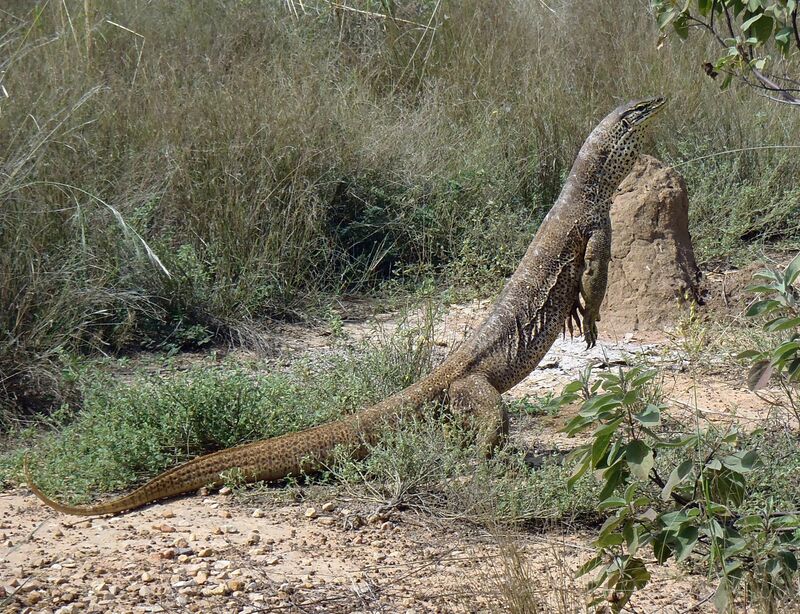 The lizard had watched me do this before turning abruptly into the bush. We both jumped out and I spotted the grass stalks waving about 40 feet away. 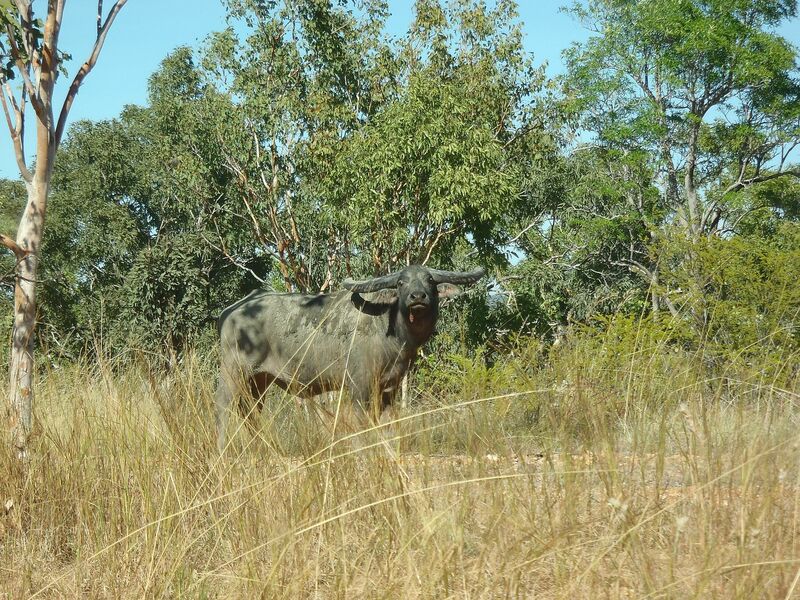 Annette charged into the bush with her camera, snapping pictures as she went and with me not too far behind. 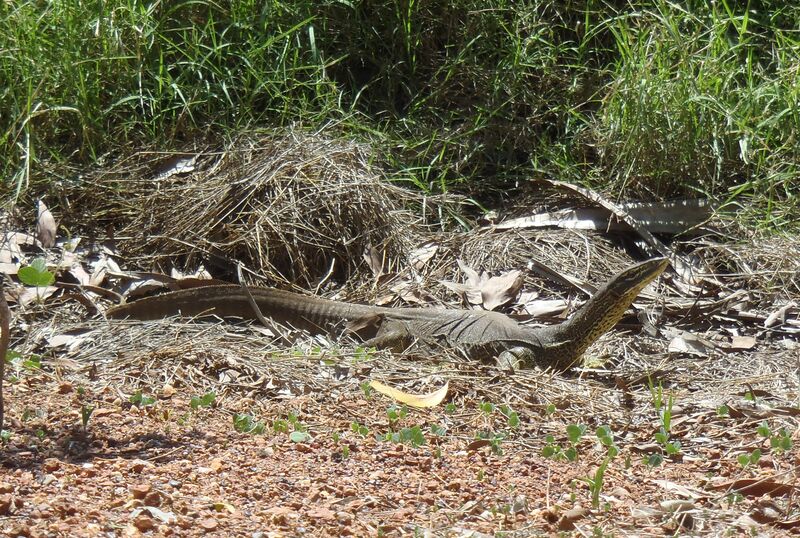 This was a very large monitor lizard, maybe 5 1/2 feet long and he (she?) first turned and glowered at us before raising itself on its hind legs with the front legs off the ground. It had a long snake-like tongue which it whipped angrily and a frill that it lowered from its throat. We were duly impressed - a spectacular creature! Our destination for the day was Fitzroy Crossing and we were denied space at the Crossing Inn where we had stayed outbound, since it was full to capacity. We were directed to the Fitzroy River Lodge and although this place lacked the ambiance of the Crossing Inn, it made up for this by providing one of the best meals we have enjoyed in Australia. We finally got to celebrate our anniversary! A long driving day to the town of Kununurra. We have an appointment Friday morning in Darwin to get the bus serviced and we needed to make up some kilometers. A good trip nonetheless with pleasant scenery - flat plains to Halls Creek and then hills and mesas as we passed by the Bungle Bungle ranges. Annette played her “G’day wave” road game with the oncoming traffic and her game has now reached a boggling level of complexity. She will need a small book to detail her game rules and she uses a bewildering array of different colored counters (derived from household bottle caps) that keep track of her scoring system. Playing the game is fun and serves the purpose of helping us both to stay alert as we navigate the hazards of outback driving. 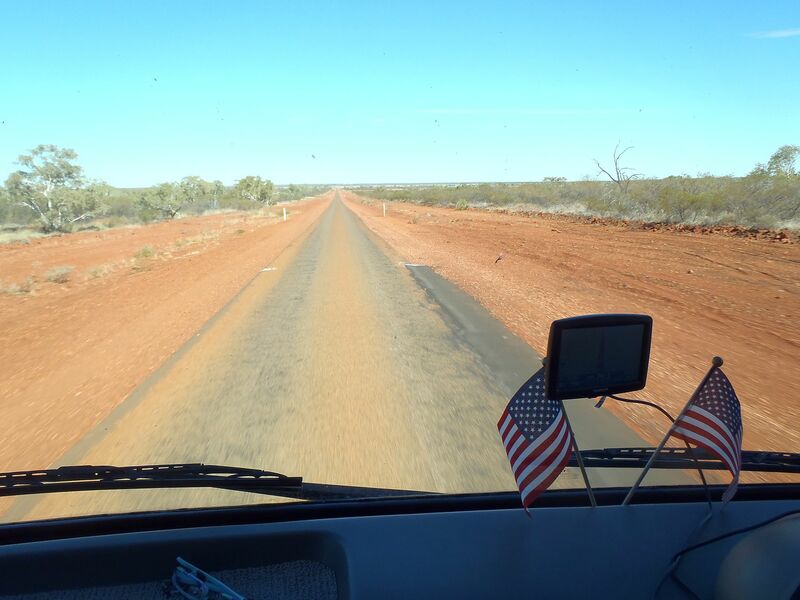 We rolled across the border from Western Australia back into the Northern Territory, barely slowing down for the transit. Annette had been force feeding me oranges and tangerines for the past few miles, so that they wouldn’t have to be thrown away and it either wasn’t necessary on this route, or we were so overdosed with vitamin C, we bypassed any agricultural checkpoint. The sunny day continued with rolling terrain and then we followed the valley of the Victoria River, past the Victoria River roadhouse where we went “crocodile fishing” with beer cans just a few weeks ago. 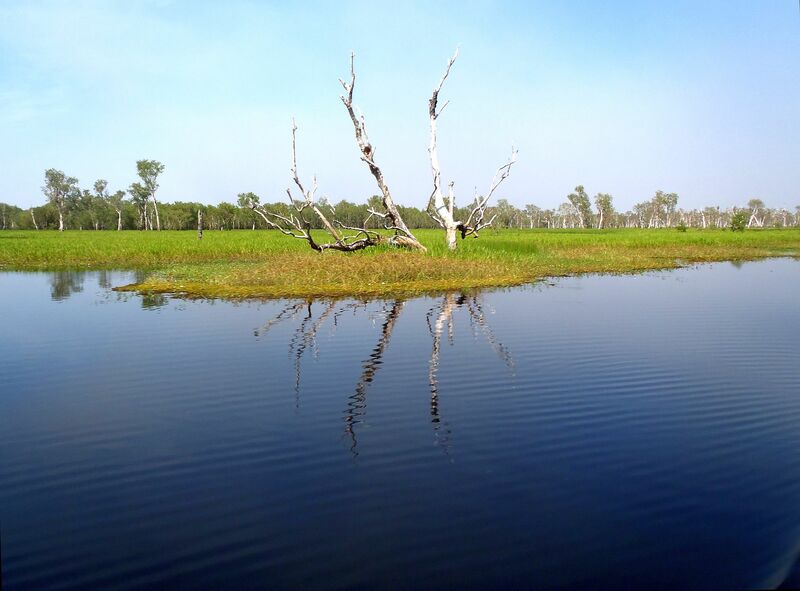 This was a truly beautiful drive and we stopped for the night at the town of Katherine, astride the Stuart Highway. 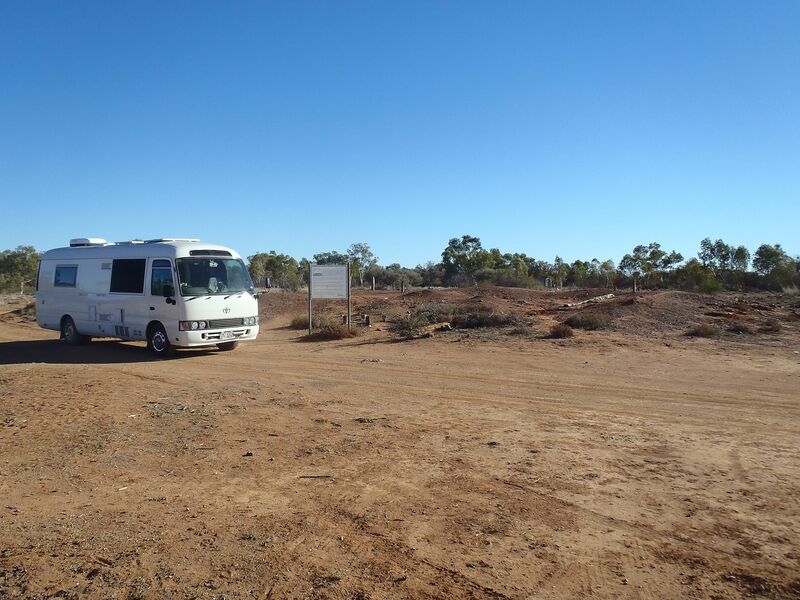 This past week was slow as we both serviced the bus and prepared to meet daughter Marian in Darwin. 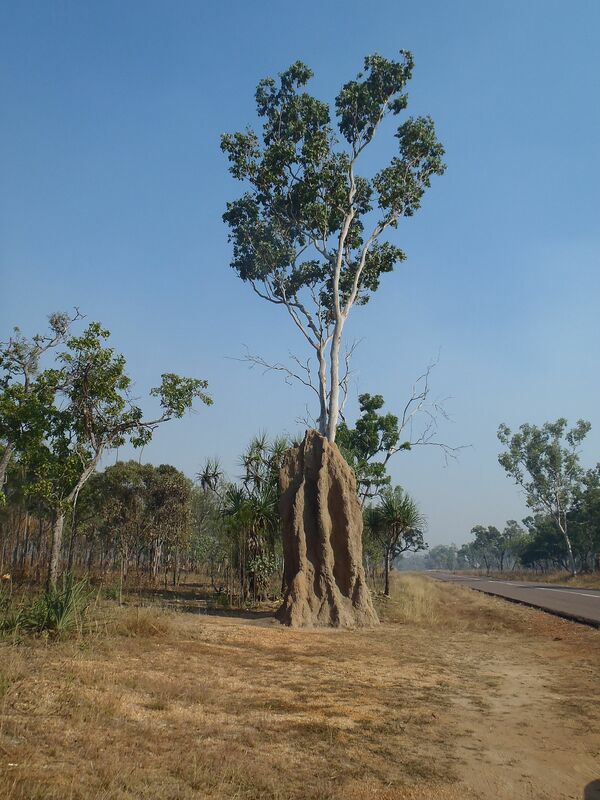 We began by continuing our journey north from Katherine and as we drove, the outside temperatures began to rise, plus there was a noticeable increase in humidity. The coolant leak from the bus heater had increased dramatically over the last few miles but we kept the the radiator topped up and made it in to the caravan park in Palmerston without overheating. The following day the bus was serviced and the heater problem temporarily patched by plugging the “heater” hoses. We don’t need the heater working in this climate and will get the heater repaired properly, somewhere down the road. We next moved a little closer to Darwin with a goal of buying some bedding for Marian. We needed a sleeping pad plus camp bag, as there is just floor space for these plus room to access the “en-suite” potty in the middle of the night without disturbing everyone. Annette keeps muttering darkly that, “It’s better than tent camping!”. Saturday in New Mexico and Marian’s flight took off, bound for Los Angeles and then Sydney. 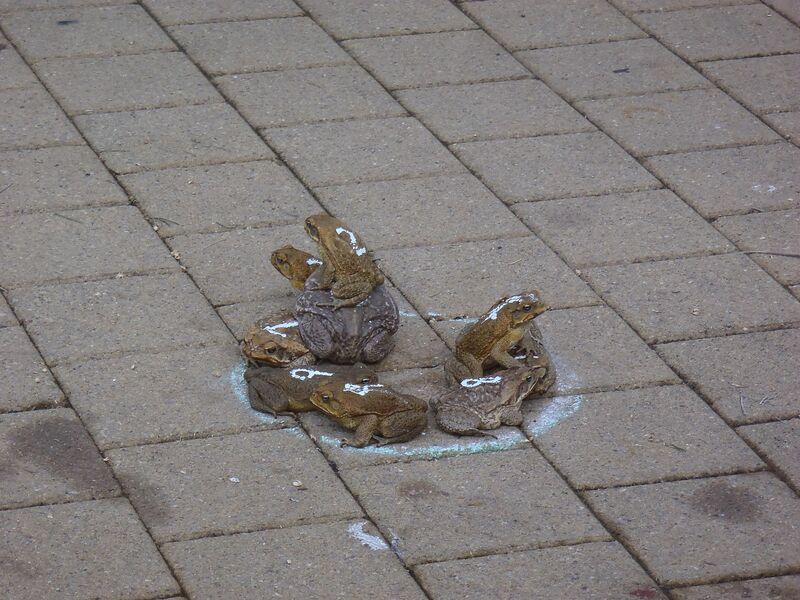 For us in Darwin, it was already Sunday and we entertained ourselves by attending the weekly “toad races”. 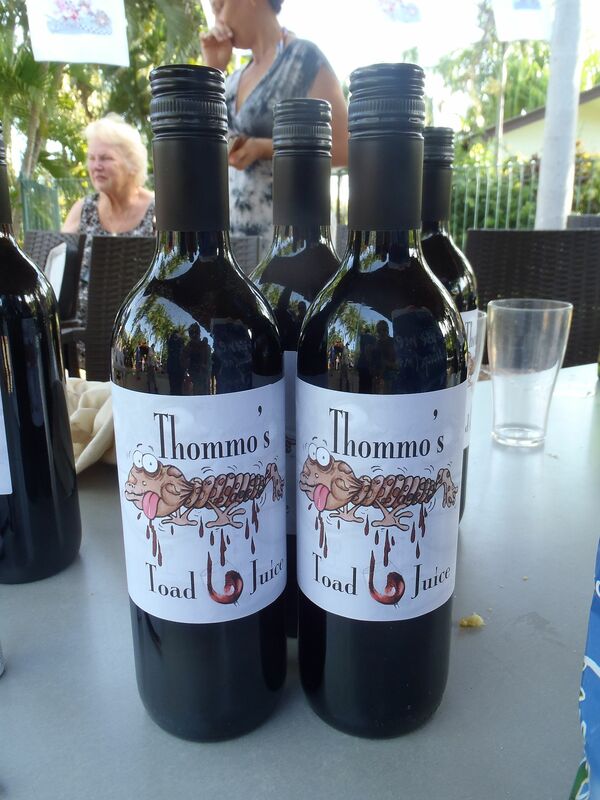 The races were organized by “Thommo”, a retired comic and seasonal resident of the caravan park. The event was held at the park swimming pool, conveniently adjacent to the bar and participants placed $5 bets on cane toads that had been identified with large “typewriter white-out paint” numbers on their backs. 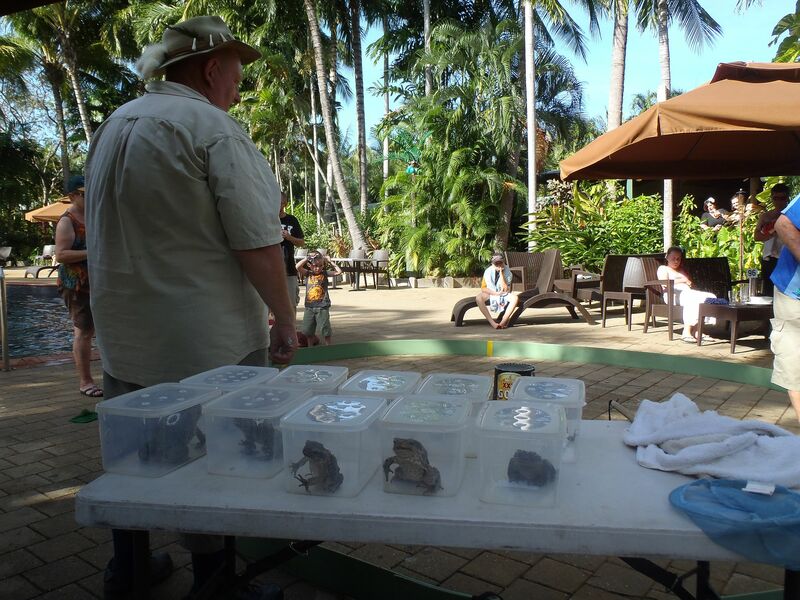 Thommo insisted that the punters pick their own toads from their plastic containers and place them carefully through a hole cut in the base of an inverted bucket in the middle of his “course”. The information centers in Australia are stuffed with brochures warning of the hazards of handling cane toads. We have been solemnly warned on more than one occasion that cane toads can kill a full grown dingo by “spitting” venom at them. 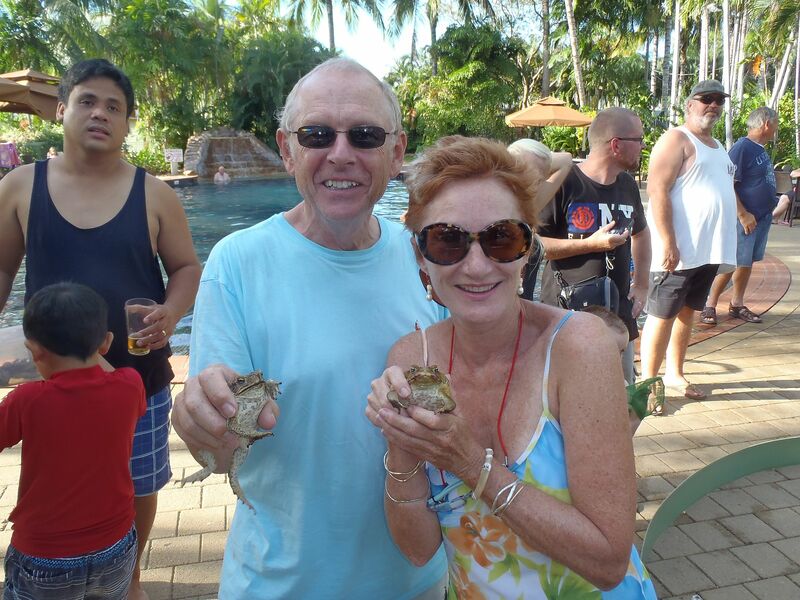 Of course Annette had been raised around cane toads on the Pacific island of Guam during the 60’s and one of her favorite pastimes was playing with the huge squishy amphibians. 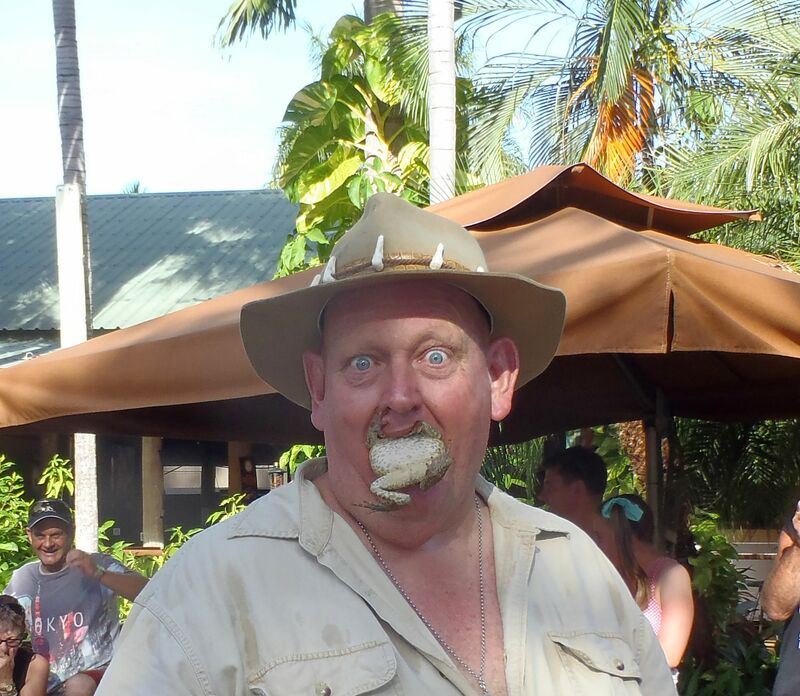 Thommo further dispelled the common fear by placing a large toad, headfirst into his mouth and standing there with the protruding legs wiggling, whilst the amazed onlookers took pictures. How he managed this we don’t know, because cane toads do produce a milky toxin from glands from just behind their eyes on the top of their necks. Annette reports that her teen toad mauling experiments would occasionally produce itchy skin but she simply washed her hands to dispel the effect. The toad races were conducted by snatching the restraining bucket into the air, leaving ten dazed toads staring at the audience. There were two circles on the concrete. 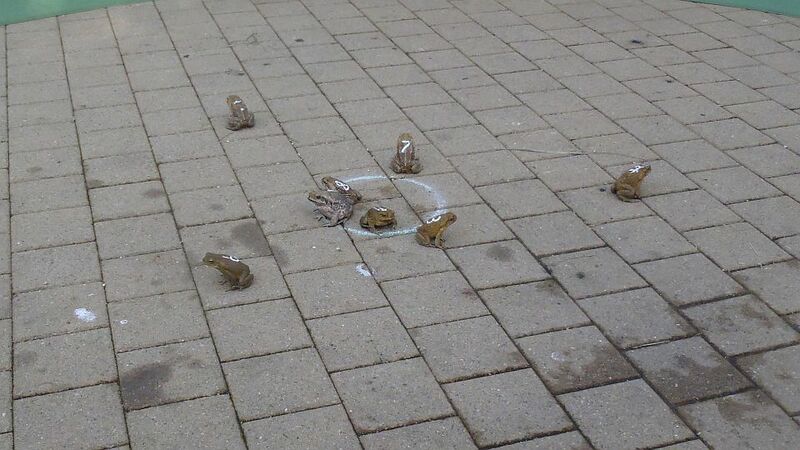 One race was won when the first toad crossed the outer circle and another for the last toad to leave the inner circle, all accompanied by the screams and curses of encouragement from the enthusiastic punters. At the end of each heat, several volunteer children would attempt to recapture the now fleeing toads as they sought freedom, hopping between the legs of the onlookers. Really fun mayhem. Monday was the Queen’s official birthday (she has several) and we received a call that Marian’s flight had been delayed by fog in Sydney and diverted to Brisbane. By the time she arrived in Sydney, she had missed the connection to Darwin. She then had to chill for the balance of the day before taking the same flight, the following day. I am a little surprised that Qantas has but a single flight per day between the major cities of Sydney and Darwin but hey, at least she got here! That morning Annette had exchanged most of the bedding we had purchased the previous day because it didn’t seem soft enough for her rigorous “Princess and the Pea” testing. We met our girl at the airport and whisked her over to the Hog’s Breath Café (a franchise that doesn’t in fact sell pork) to feed her, before heading back to the caravan park. At the park, a jet lagged Marian discovered the Australian fruit bats and was fascinated enough to wander around in the park in the darkness, trying to spot them by flashlight, high in the tree branches. 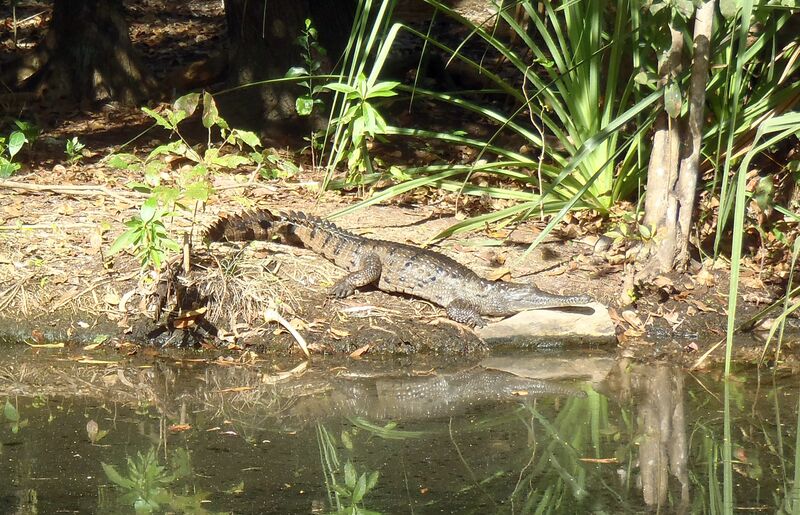 We returned to Crocodylus park today to watch the crocodiles being fed and because this park also has extensive displays of other native wildlife. 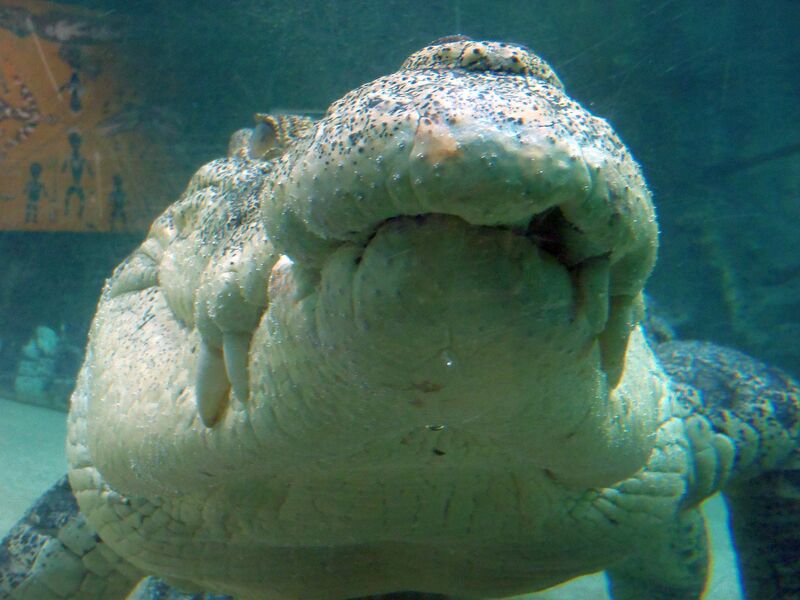 The park operates as a farm, selling crocodile meat as well as high end fashion products such as handbags made from crocodile and other exotic skins. 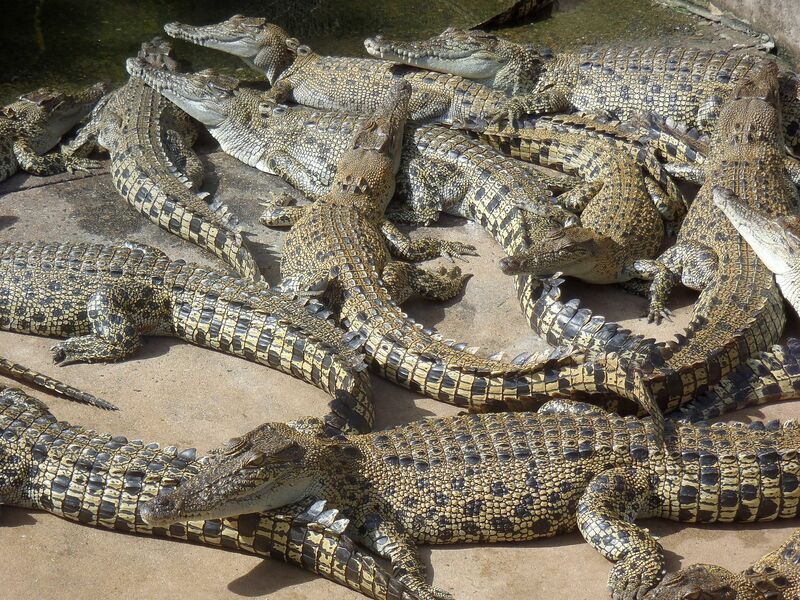 Much of the crocodile hide is exported to Paris, France for their fashion industry. 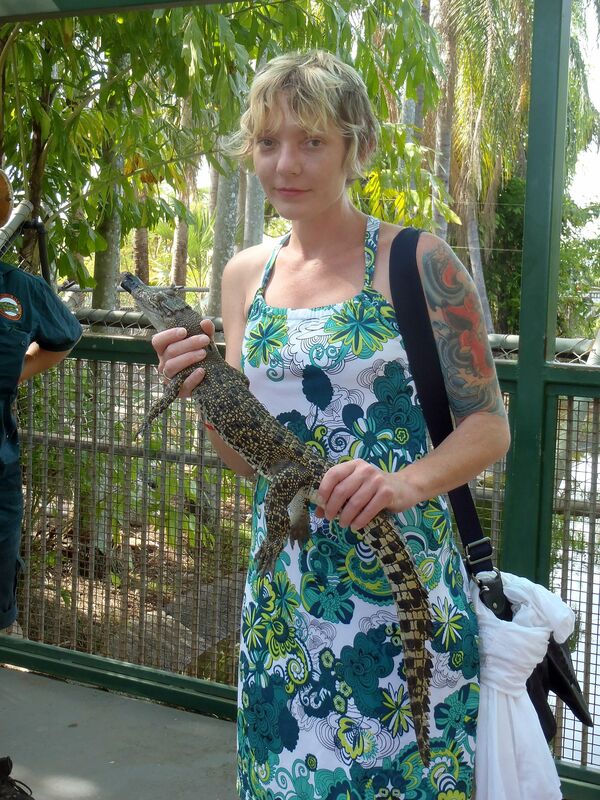 Annette bought crocodile meat for barbequing tonight. She had been warned that it needs very light cooking to avoid toughness. No, it doesn’t taste like chicken. Textured more like beef with a delicate flavor. We visited the Museum and Art Gallery of the Northern Territory to see the great displays of art, ranging from traditional to modern art by both native and non-native artists. 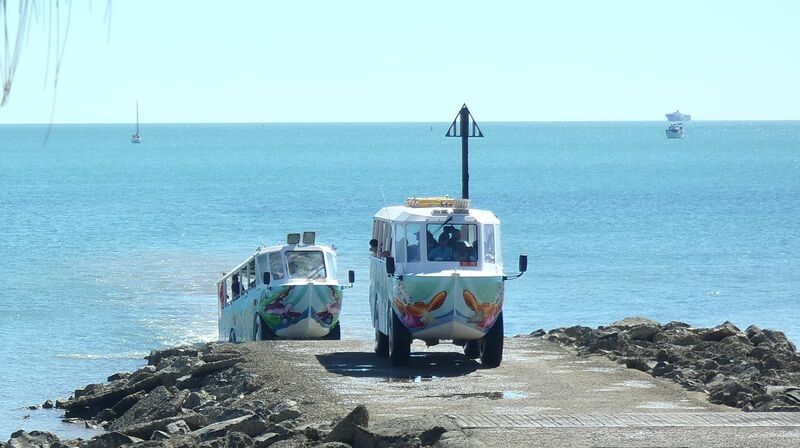 As we arrived there was a “Duck”, an amphibious military assault vehicle, converted to tourist use, descending the adjacent boat ramp into Darwin harbor. It was really cool to see this huge open truck, serenely floating on the sea instead of disgorging its passengers into the waiting maws of predatory crocodiles. I was further fascinated to read that a similar vehicle had recently capsized and sunk in the harbor in Liverpool, England. Last year Queen Elizabeth had ridden in that particular vehicle and unlike the 2013 tourists, she hadn’t had to swim ashore. We next toured the Darwin WWII oil storage tunnels and again marveled that Darwin had been attacked with such ease and further of the huge physical effort constructing the storage tunnels that were not completed for use until the war was over. 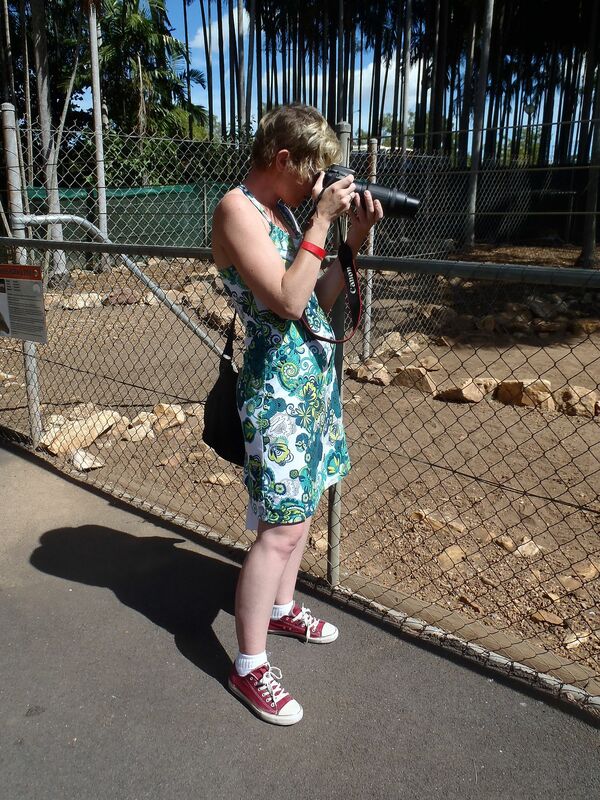 Today we visited the Northern Territory Wildlife Park, that lies some 60 kilometers to the southeast of Darwin. 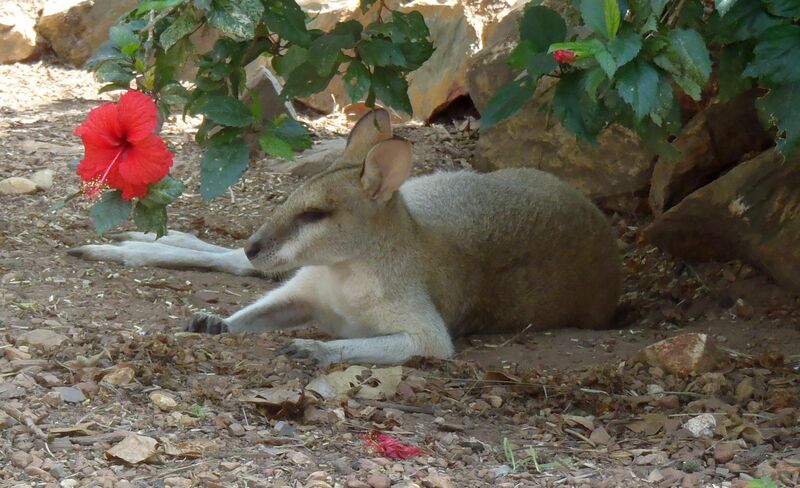 The park had some very good displays of native wildlife but the favorite was a female wallaby with a “Joey” that we found in the park picnic area. 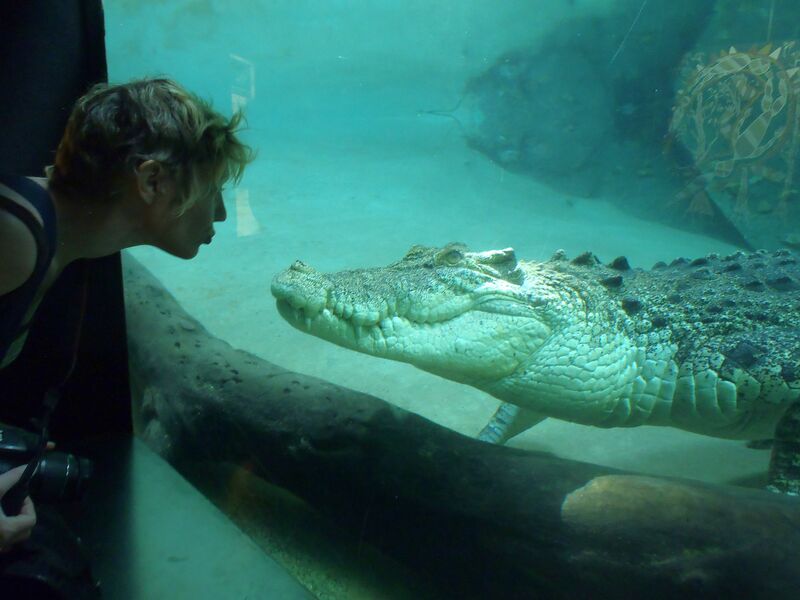 It was obviously quite tame and licked Annette’s arm as she petted it. 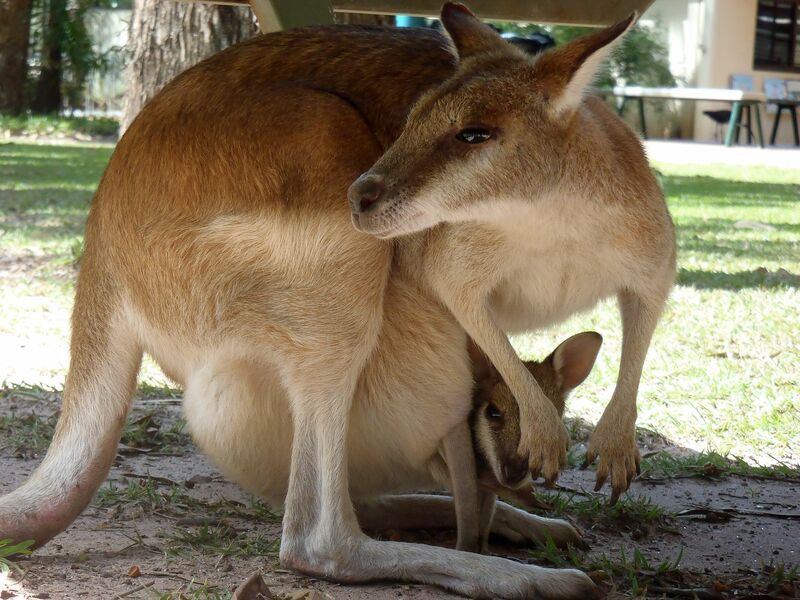 The “Joey” did all of the cute baby things like falling out its mother’s pouch, hopping around awkwardly before plunging back inside momma. 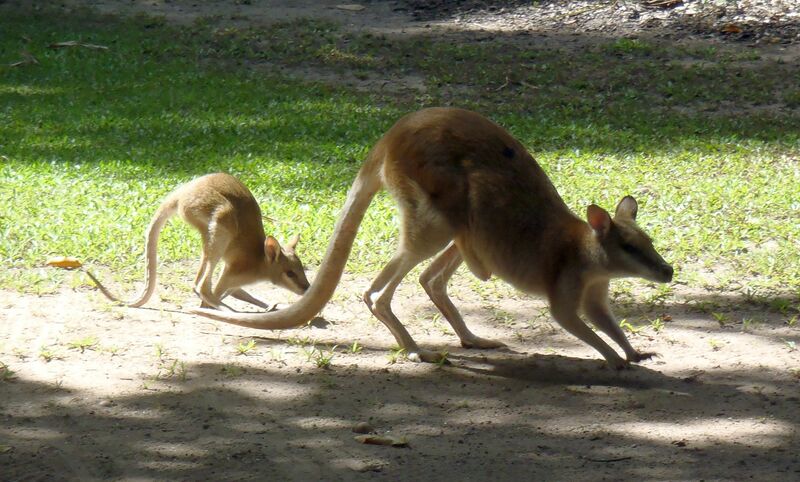 We then witnessed its head plus very long back legs, both poking out of the pouch, as the momma wallaby grazed and allowed herself to be stroked. Back at the caravan park that night, Annette and Marian used mirrors to photograph the large green frogs living in the toilet bowl and then moved on to stock whip practice. Just about every Australian male is a former stockman or master whip cracker and the pair soon had volunteers demonstrating the proper way to hold and crack the whips. The temperature gauge on the bus had been operating erratically on the drive from the Wildlife Park and after checking the obvious things, I decided it was likely a thermostat issue. After calling around, I was assured that I needed to go to the main Darwin Toyota dealer. I called them and the very earliest appointment I could get was for next week. We determined to park the bus at the caravan park in the interim and rent a car from the airport. 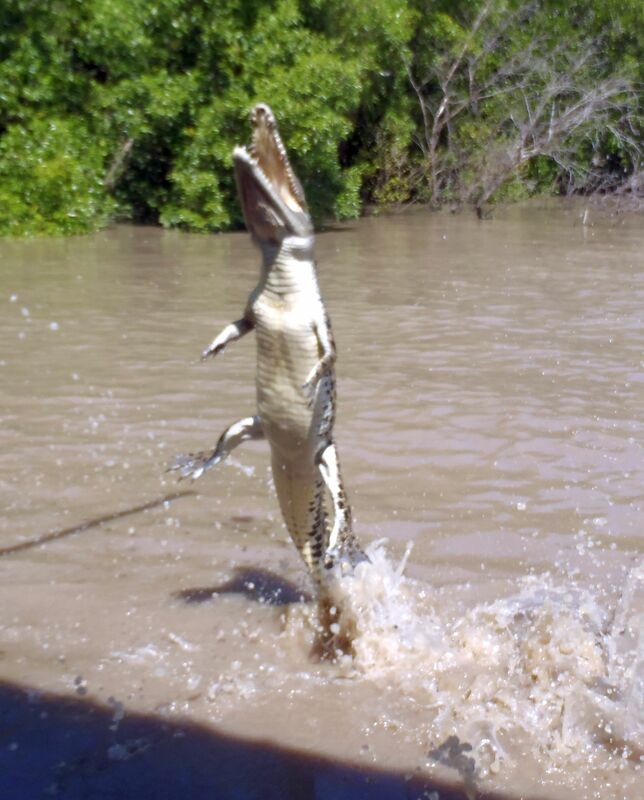 This morning we picked up a rental car from the airport and drove out to the Adelaide river for a “croc” tour. 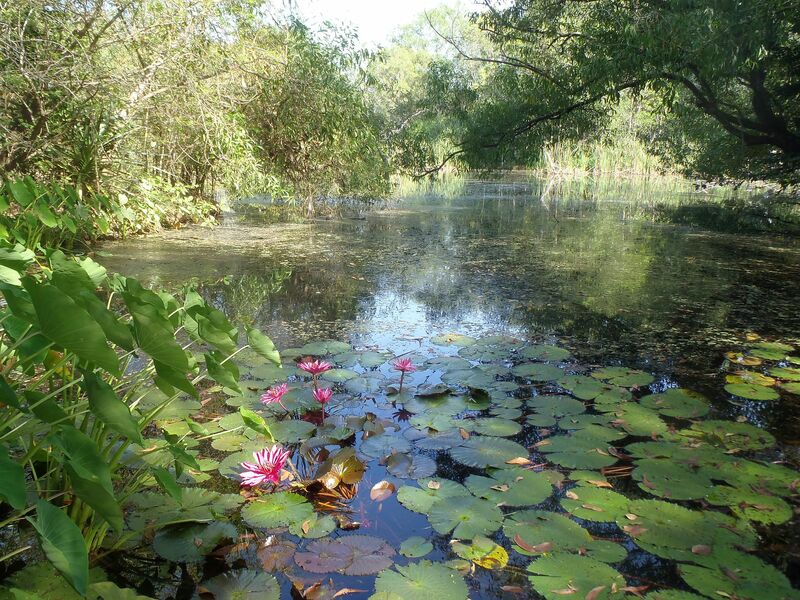 We chose the smaller company for this endeavor, the same as we had used during our 2006 visit. 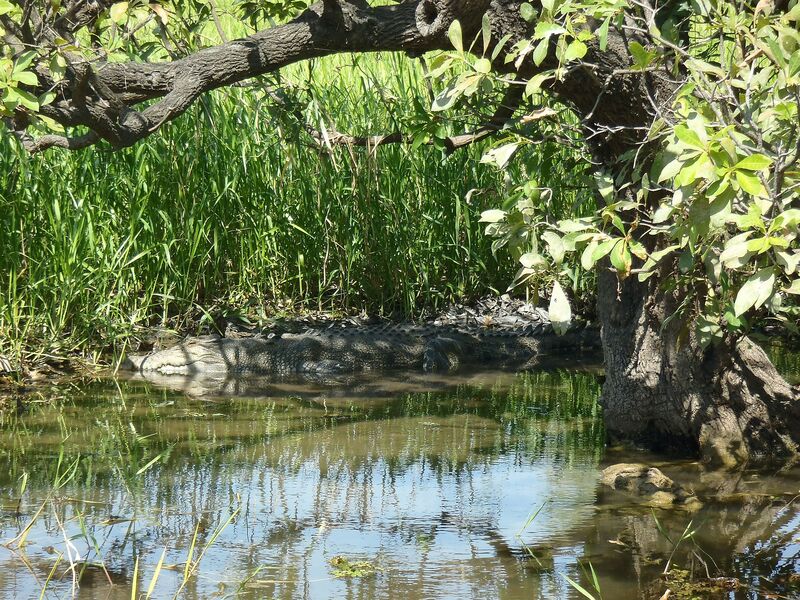 The route to the croc tour took us near the Fogg dam and since we were early, we drove across the access road where we had to stop for a monitor lizard on the side of the road. 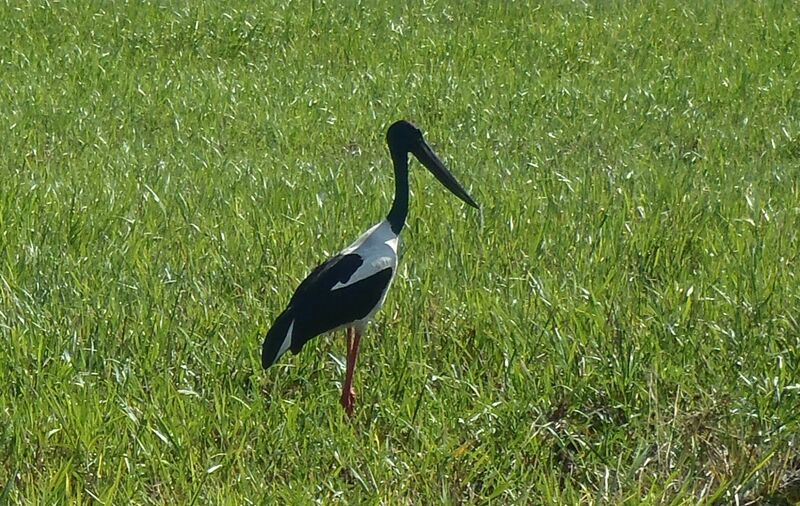 The floodplain of the Adelaide River stretched out below us and we could see hundreds of Pied geese and Brolga cranes hunting for all sorts of slimy delicacies in the swamplands. At the river we climbed aboard a much smaller boat than our previous croc tour although noted that a safety rail had been added since 2006, providing another 12 inches or so of protection above the low freeboard of the vessel, This was a wonderful tour and we experienced a five meter crocodile (16 to 17 feet) within inches of the guardrail. 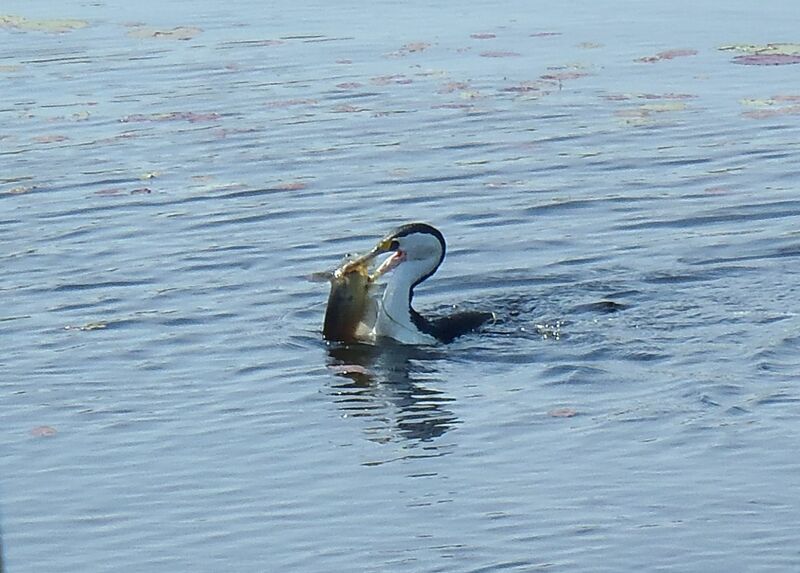 The sound of his jaws snapping shut was particularly impressive as he missed the proffered bait and struck heavily against the side of our boat. I held firmly onto Annette, preparing to brace myself if he grabbed her instead of the chunk of buffalo meat. We noted that the men’s bankside toilet has been upgraded since our 2006 visit. 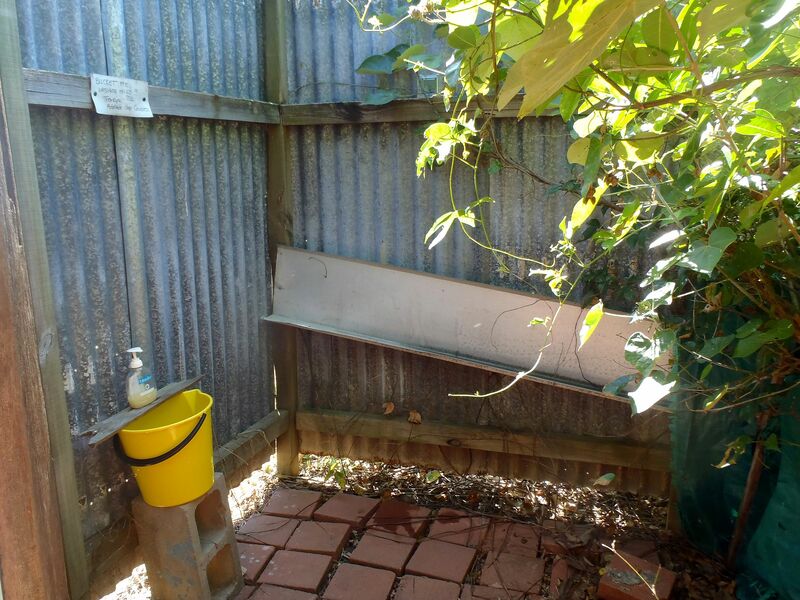 Instead of just a piece of angle iron nailed to a couple of posts channeling the pee into the river, it now has a piece of sacking screening the river end of the dunny. The ladies toilet still had the commode, vanity and fake flowers in a vase for the more genteel customers. 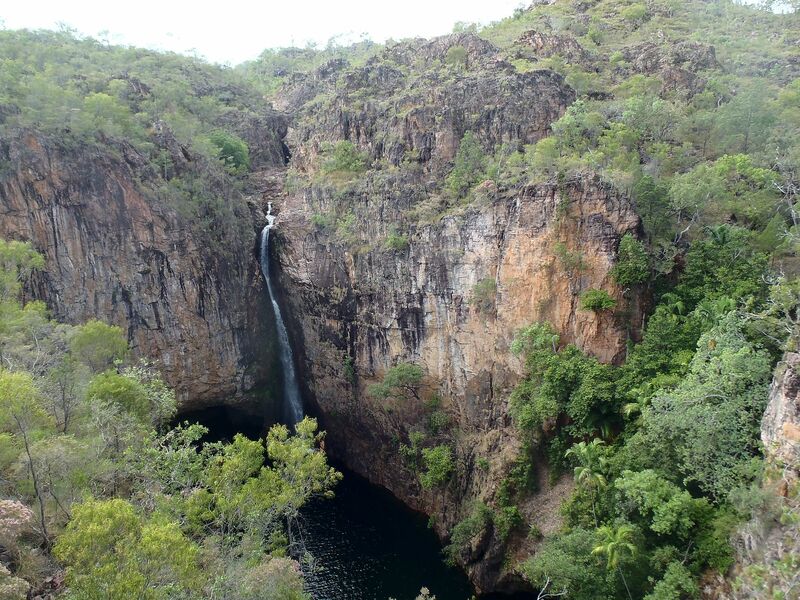 Today we set off on a trip to tour the Kakadu National Park. On the road, Annette amazed all by spotting a crocodile sunning itself on the on the muddy bank of the West Alligator River as we flashed by in the rental car. Of course we had to pull over to the side, while the amateur photographers risked life and limb taking pictures from the bridge, as heavy trucks whizzed by. 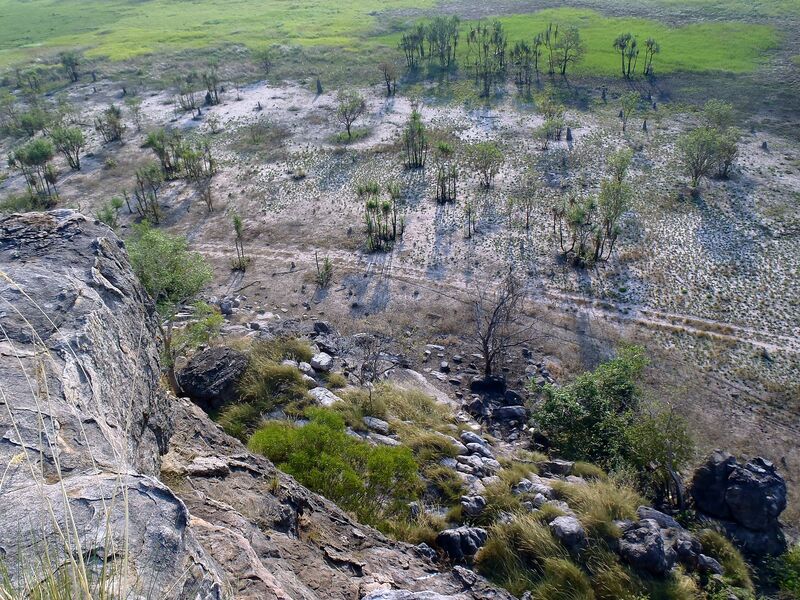 Our destination was Ubirr and we visited the site of the wonderful rock paintings, created by generations of aboriginals who utilized the area’s natural shelters during inclement weather. From just the subject matter of the paintings, fish and turtles were high on the available dining menu with just the occasional kangaroo. When we climbed the overlook we could see a large kangaroo grazing on the flatlands below. 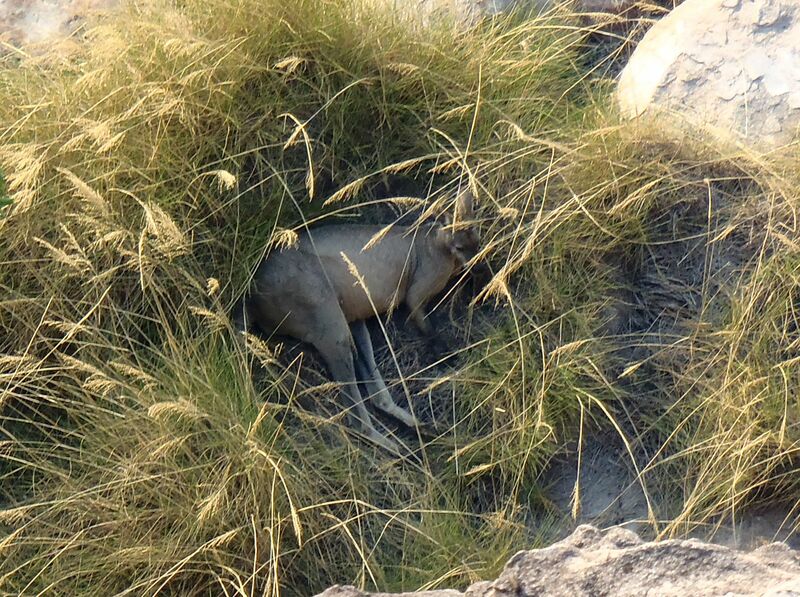 We walked along the rim of the mesa and Marian spotted another kangaroo, curled in a sort of nest and fast asleep. 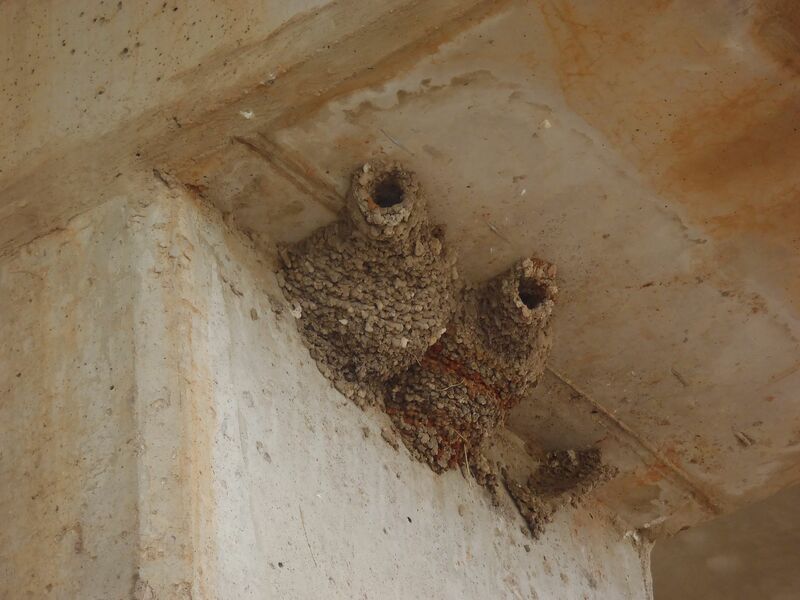 Now we understood why the buggers are so hard to spot during the day. This visit was the third time we have been here but Ubirr remains a magical place for us. It was late afternoon when we set off for the Aurora Hotel near the South Alligator River, where we had arranged to spend the night. As we drove along the empty roads, there were multiple brush fires burning all around us. 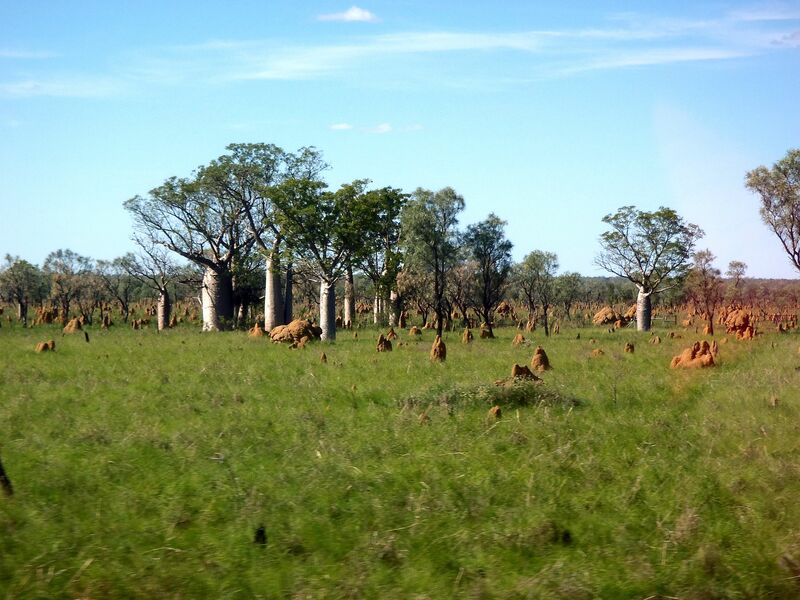 These are supposedly set as post wet season “cool” burns to prevent the build up of fuel that might later enable a destructive “hot” burn, destroying all vegetation and sterilizing the earth. At least that is the theory, although we could not see a discernable pattern to these fires and smoke blanketed the highway for many miles. 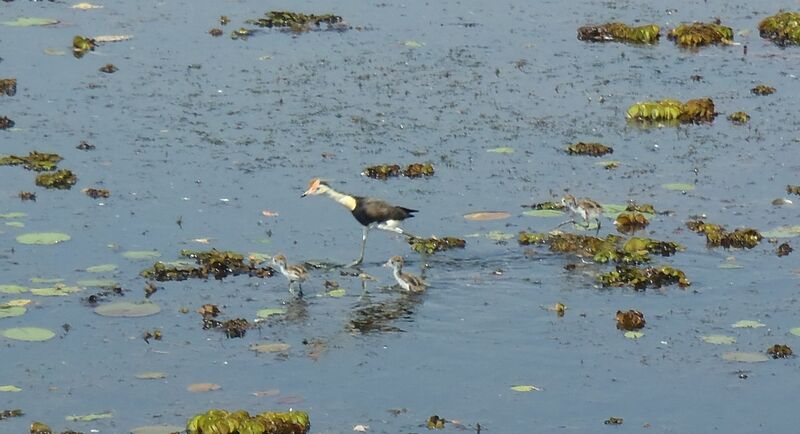 As we crossed a causeway over a long bridge, a small four-legged creature loomed at us from the middle of the highway. This was a dingo and we followed it slowly, as it scampered through the smoke until it was able to get off the bridge. When we saw a recently lit fire blazing fiercely next to the road, there were dozens of kites, wheeling through the dense smoke and supposedly feeding on the insects displaced by the flames. A bizarre sight since we have been brain-washed since childhood by the movie “Bambi” to expect that all animals flee from fire. In fact, over the past months we have several times witnessed this phenomenon of large birds, circling amongst the smoke and flames. In the past I have seen sea-birds – “Frigates”, circling at night like pterodactyls in the oily smoke and flames being vented by a Mexican offshore drilling rig in the Bay of Campeche, presumably on a similar bug-hunt. Another visual treat when we approached our hotel was seeing dozens of fruit bats, flapping lazily across the open fields, silhouetted by a smoky sunset and ruddy sky. We had booked a Yellow River tour operated by the Gagudju Lodge at Cooinda and during our morning drive to the hotel we were delighted to spot more dingoes along the roadside. 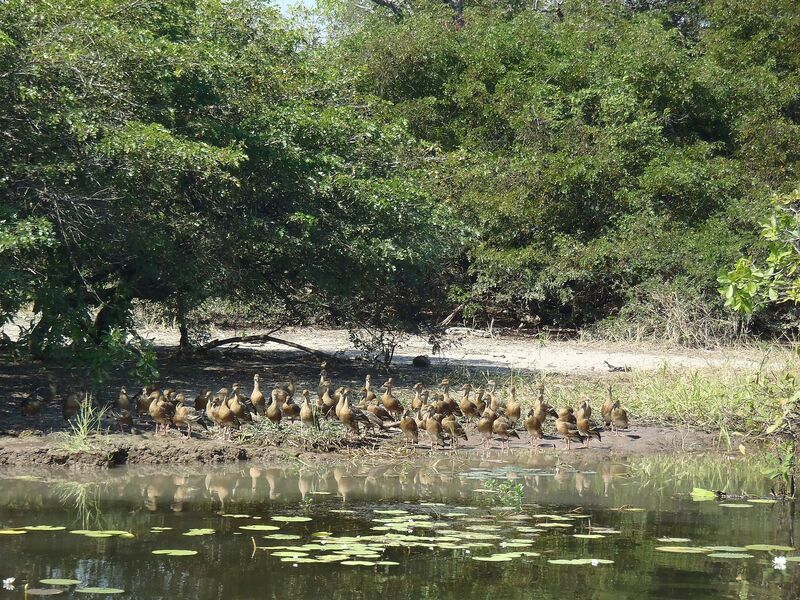 This tour is an excellent and relaxing way to see all kinds of birdlife as well as crocodiles in the billabongs and rivers. After the tour Marian and I took a short walk to the nearby boat landing, where we ignored the “Staff Only” signs and boarded the pontoon that served as a boat dock when the water levels are higher. 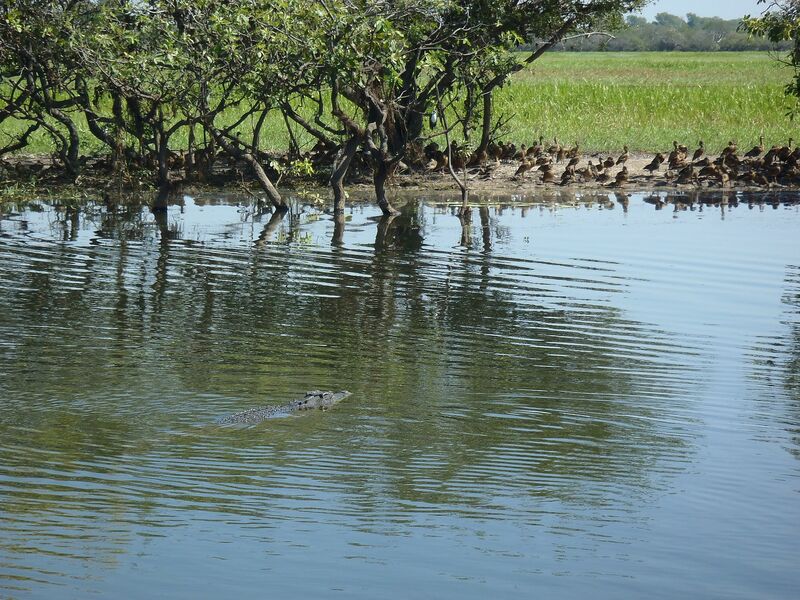 In the distance we could see a large salt water crocodile and watched carefully as he stalked us. Our morning tour guide had explained how her husband was the mechanic for maintaining and repairing the outboard engines on the various boats that the lodge used. She told us that he teams up with a “watcher” to guard his back from crocodile attack when he works near the water. 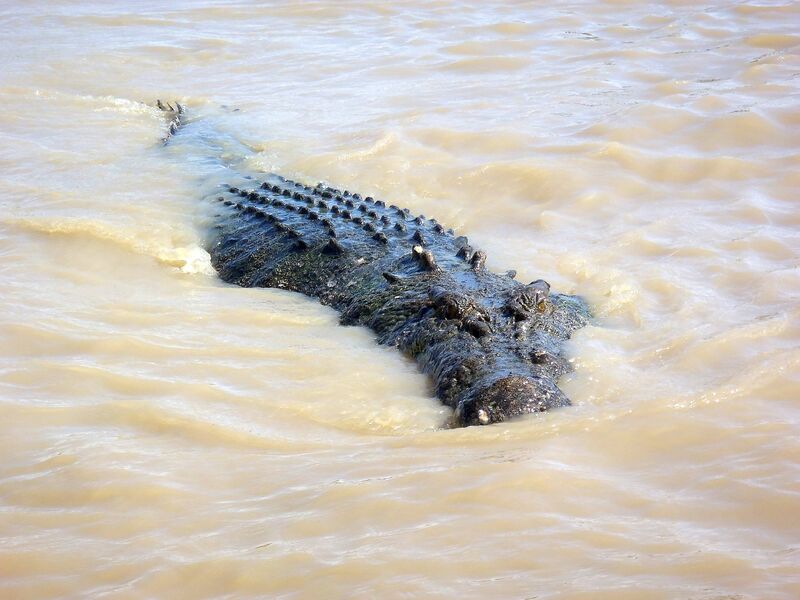 The crocs are “opportunistic” hunters in that they will attack most anything that moves in the water but since the age of the dinosaurs, they have perfected their method of “ambush” hunting. 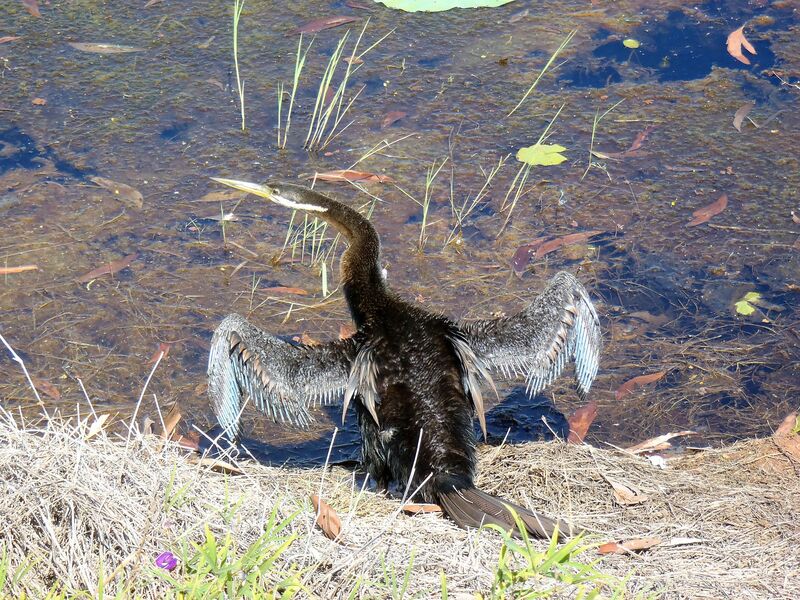 If a creature performs some task on a routine basis, like dusk drinking or working on a motor near the water, the croc will be lying in wait at that time and location for the lighting lunge, the seize and the drowning of the victim. Their primitive brain indicates that we are just “food” and they do not see us as the top predator. On the continuation of our drive to the town of Pine Creek on the Stuart Highway, we passed lots of wallabies and for the first time since we have been in Australia, we saw a pair of feral Buffalo crossing the road. The buffalo were introduced in the 19th. century to supply meat for the Northern settlements. 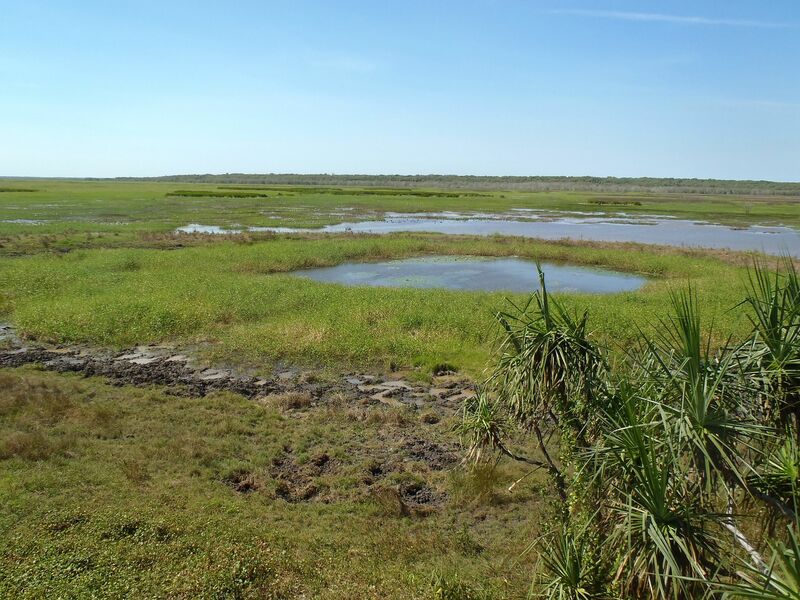 By 1950 both the settlements and the buffalo had been abandoned but the latter’s numbers expanded and they soon began causing considerable damage to wetlands. 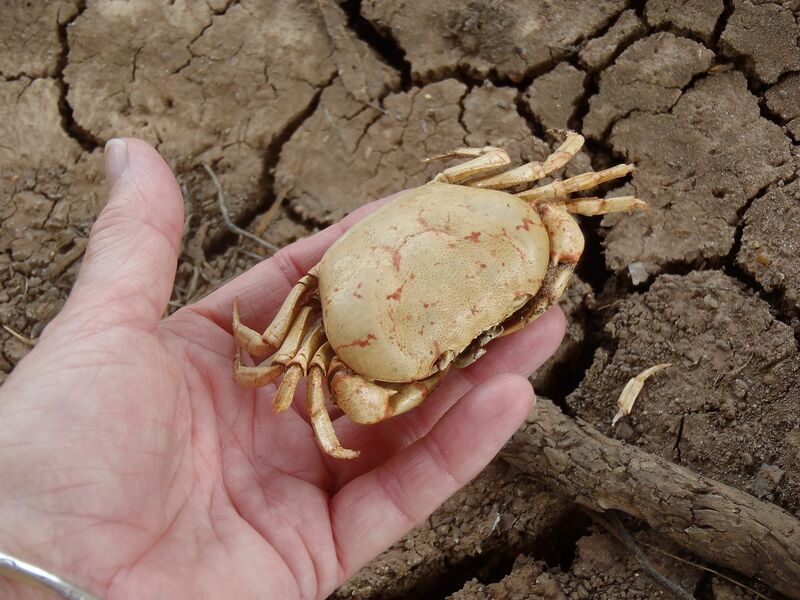 The government has since attempted to eradicate them and you must admit, they are much easier to spot than a cane toad. 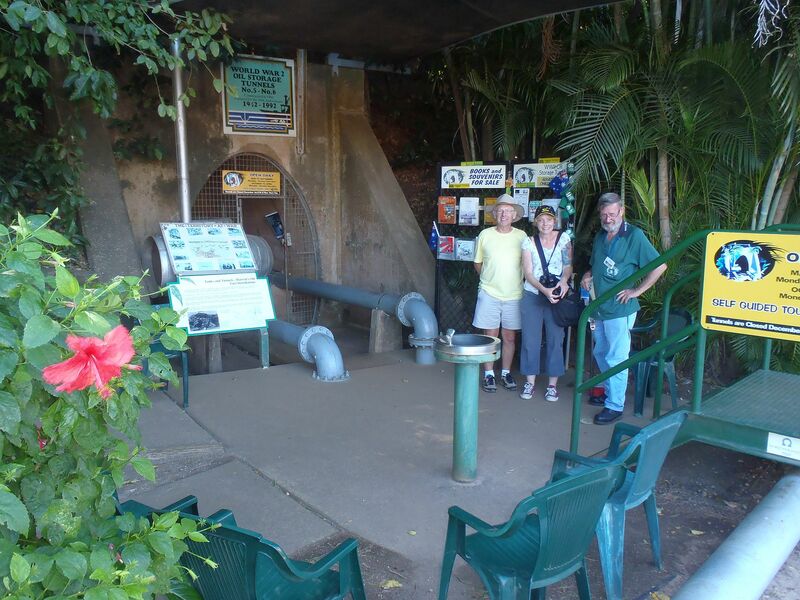 In Pine Creek we visited the rail and mining museum as well as the Lazy Lizard pub. This outback pub is built from mud brick and local timber and we tried their “Lazy Lizard Burgers” - which were quite tasty once you picked off all the beetroot. Coaster Day finally arrived wherein the Darwin Toyota Dealer would deign to look at our bus thermostat problem and we headed over to the dealership to await their opening. When they asked us for our street address for the paper-work, I responded, “Bridge Toyota, Darwin”, again reminding them that this is a motor-home conversion and we were homeless. While we waited for the diagnosis, we headed over to the excellent “Darwin at War” museum located on Darwin’s “East Point”. Some time after noon, I got fed up cooling my heels and called the service representative. He finally called back and announced that the thermostat was indeed faulty. They would replace the thermostat and a fan belt but the necessary gasket was unavailable in Darwin and would have to come from Perth in another weeks’ time. To say I was boggled was an understatement. A week for a gasket? Could I pay extra and have it overnighted? “Not possible”, the response. I then queried the price for getting the heater core replaced. “Big Job”; “Yes, I know that. How much?”; “We have to remove the whole dash”; “Yes, you first remove the instrument panel, then the dash, then the windshield wipers; then you have the heater access – How much?”; “Well, we don’t know what parts are needed”; “There are only two parts – the heater core and a valve. Let’s assume you replace both, how much?”; “I will need to check on parts availability”. He called me back an hour later to say that there were no parts in Australia. They would need to “special order” them from Japan – six weeks. By now I had realized that the dealer simply didn’t want to do this job. We returned to the dealership, picked up the bus and returned to the caravan park, fuming. The park manager suggested that I call the mechanic at the St. John’s Ambulance Company. Okay......, I did this and the mechanic actually answered his cell phone, indicating that they could fix our bus on Friday morning. 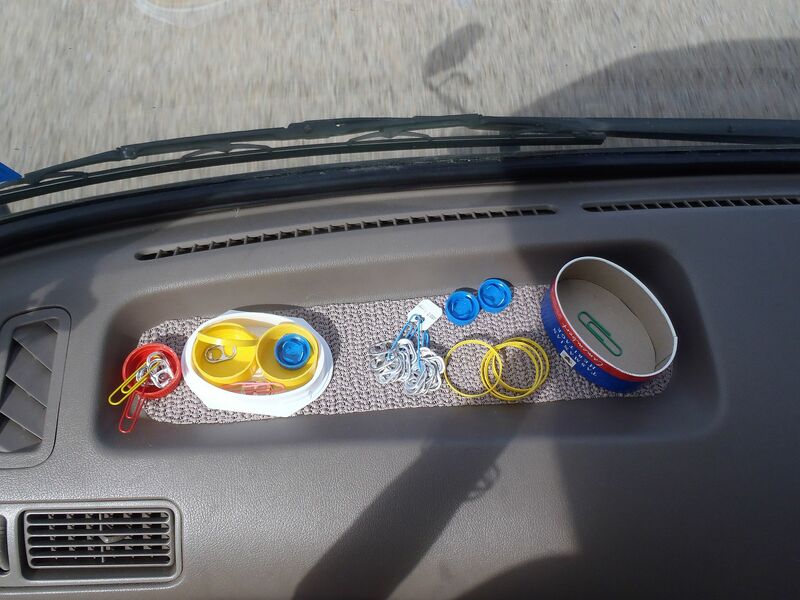 He assured me that they would have no difficulty with supplying a Toyota thermostat and gasket. Yesterday we did a little shopping and when Friday morning arrived, we set off for the St. John’s Ambulance operation. I was relieved to discover that it really does exist. The St. John’s Ambulance is a “self funding”, charitable operation that not only operates ambulance services across Australia but provides first-aid training, medical kits, community services and youth development. Sort of like the American Red Cross but that actually does something besides fund raising. The Darwin operation has two full time mechanics, plus workshops, to service the various ambulances. When they are not fixing ambulances, they work on other private vehicles on the obvious understanding that their ambulances get priority attention. In less time than the Toyota dealer had taken for the diagnosis, they had removed our thermostat, tested it and replaced it with a new one PLUS gasket. Even with their labor charge at AU$132 / hour, the bill was one third of Bridge Toyota’s quoted price. We were set to hit the road again and with some relief, returned our rental car and even charitably called to cancel the Toyota service, scheduled for next week! 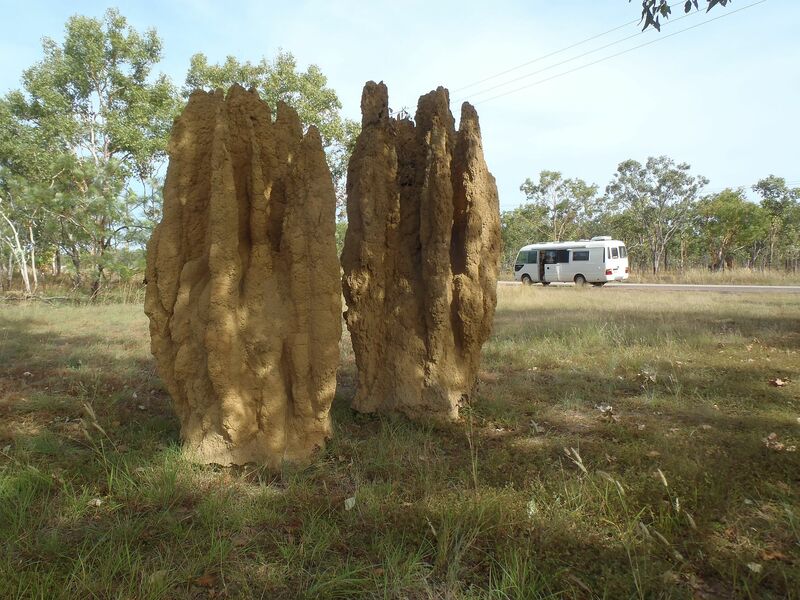 On the road again, we headed for Litchfield National Park where we showed Marian the magnetic termite mounds and the Wangi water-falls. We stayed at the Litchfield Safari Camp caravan park and Marian and I took a walk in the grounds. 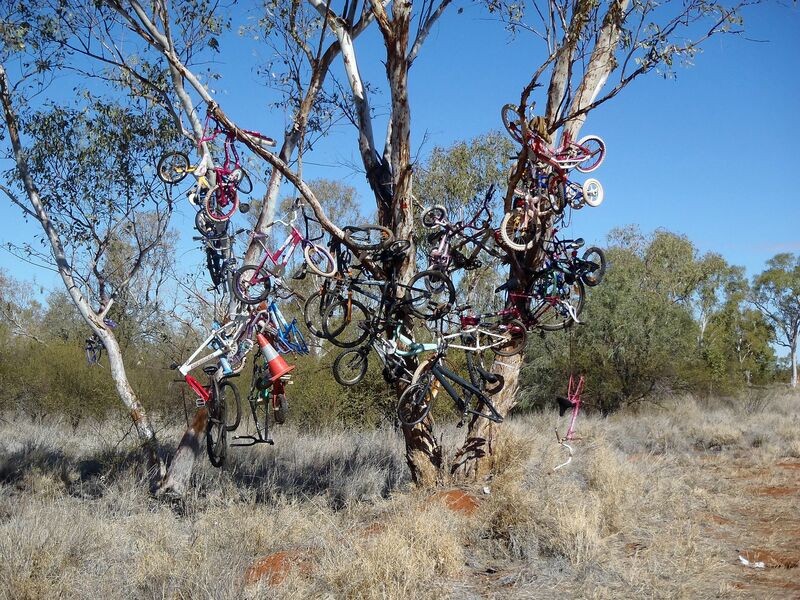 The caravan park sits in bush that has been brush-hogged or “scraped” forming long intersecting trails that in South Texas we would call “senderos”. When we walked these trails we saw dozens of wallabies grazing singly and in groups. As we approached them, a couple would hop away into the bush but there always seemed to be one that would stare at us in a puzzled manner, only sprinting away when we were really close. 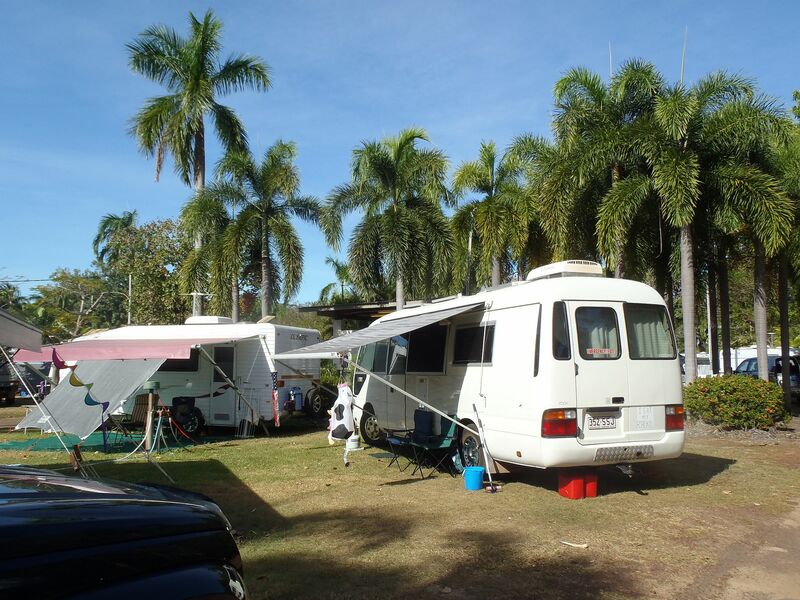 Northbound again towards Darwin and we stopped at the Adelaide River caravan park. Directly across from the roadhouse was a couple of trees with hundreds of fruit bats, roosting, arguing and chattering away. Finally Marian got to take all of the bat pictures she could ever want or need. We visited the fine railway and telegraph museum but the caretaker threw us out at five o’clock as they were closing. 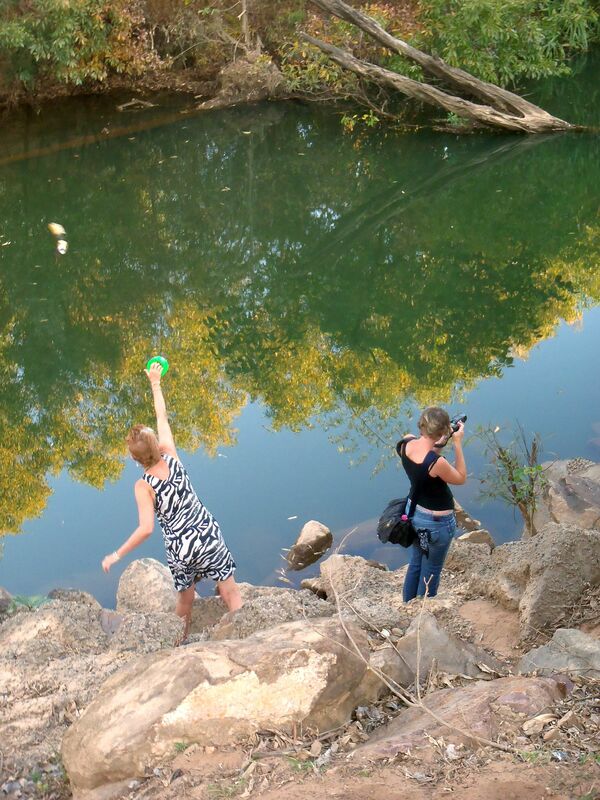 We walked back across the Adelaide River itself and Marian and Annette tried “croc fishing” with beer cans on a mono-filament line. 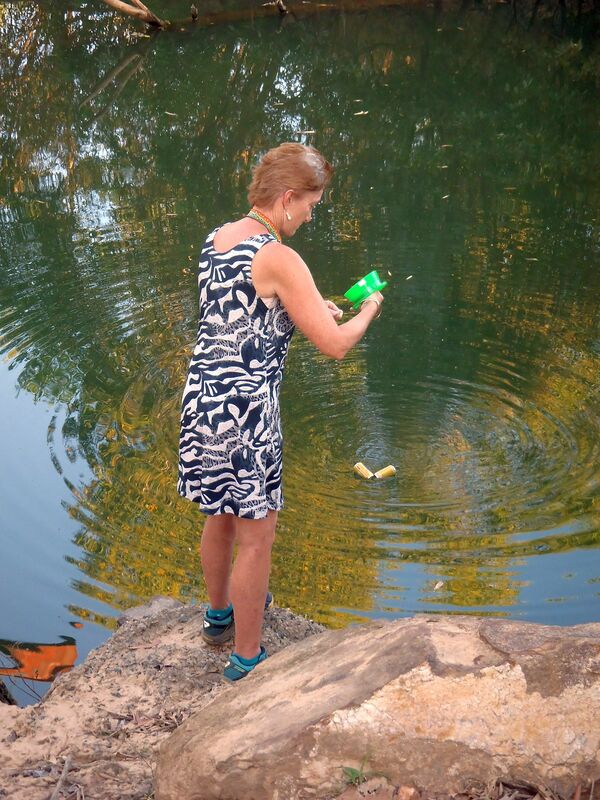 Either there weren’t any crocs there or they weren’t having anything to do with the beer cans. The only creatures getting fed were the mosquitoes, so we split. Sad day. We dropped daughter Marian at the airport for her return to the USA. We miss her already. At least we got to load her up with about 30 pounds of our souvenirs to haul back for us and she can explain to US Customs what the bowling ball sized “moon-stone” from Hughendon is for. 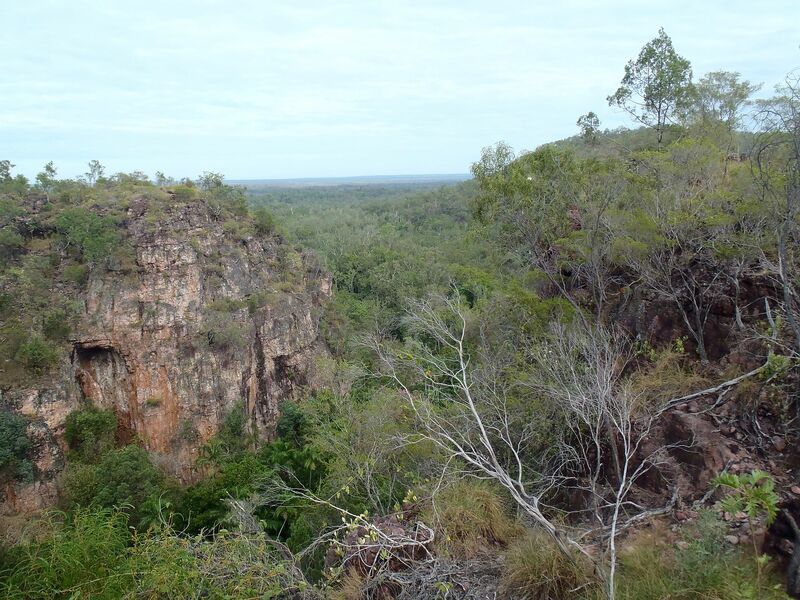 We began our return trek from Darwin and headed back down the track. Once south of Pine Creek, we began to notice that the humidity had dropped and that the soil color was changing from swampy black to desert red. We stopped for the night at caravan park in Mataranka, where there were peacocks strutting through the grounds, sulfur crested cockatoos flapping near the snack bar and begging scraps from the customers. The restaurant even had a sign requesting that the customers not feed the peacocks inside the restaurant. We wandered the park and visited their Barramundi holding pond (bloody big fish!) before heading back to the restaurant for their wine-tasting event. This was followed by a “Country and Western band”. We just had to experience Australian style Country and Western and were not disappointed. The guitar players were excellent and although the singing style was similar to 50’s or 60’s USA Country and Western, we were delighted with the lyrics. There was one song about hitting a “kanga-bloody-roo” with a car and another about the (rhymes with “banker”) from Mataranka. A fun evening. As dusk fell, there were lots of Wallabies grazing between the caravans and the park caretaker made his patrol on horseback. Maybe keeping an eye out for the Ned Kelly gang. This morning we continued south down the Stuart highway from Mataranka towards Tennant Creek. This section of road seems arrow straight through a tunnel of trees, that compresses the universe into tarmac and traffic. Suddenly we noticed that the trees have almost disappeared and we could see above the smaller bushes. 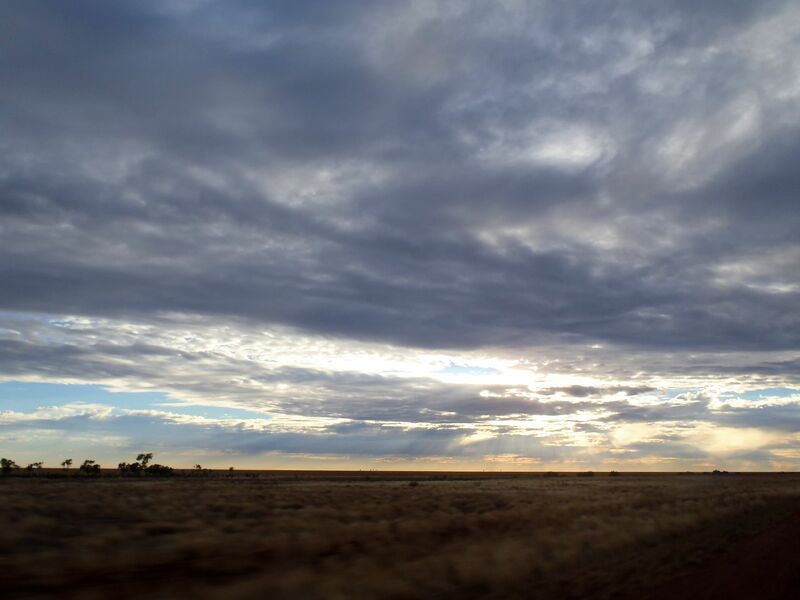 Australia opened out again and we saw distant mesas and the sweep of the plains. 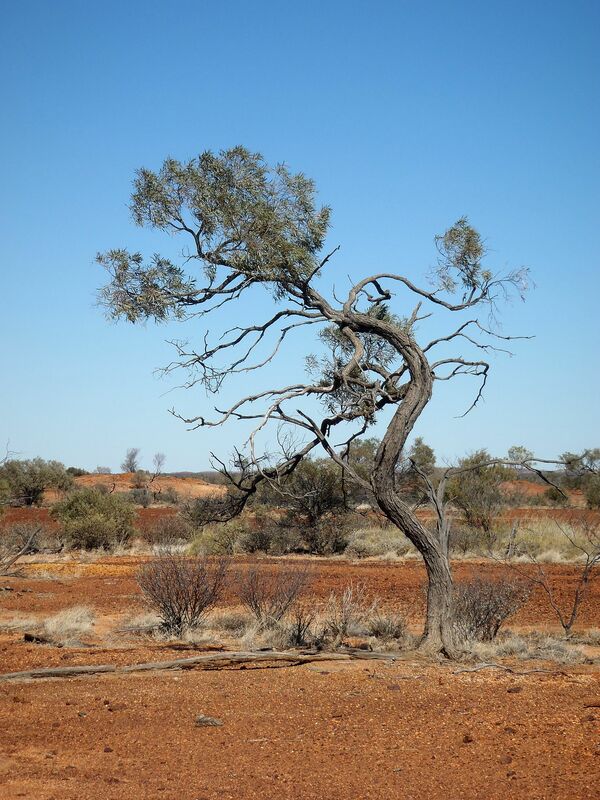 By the time we approached Tennant Creek, the colors of the red earth, the blue sky and the green of the bush were almost screaming at us. What an amazing country! My cousin forwarded a scanned notice of a traffic violation with an associated fine of $141. Since we have been driving most carefully, I was naturally puzzled as to how we have managed to break the law. Close examination showed that on February 15th. we somehow drove on a section of highway in Melbourne that was a “Toll Road for which we were not registered”. This fine isn’t for failing to pay a toll – it’s for not pre-registering somehow with their toll system. Wow! I thought I had been doing well just driving on the left occasionally and stopping at the red traffic lights. 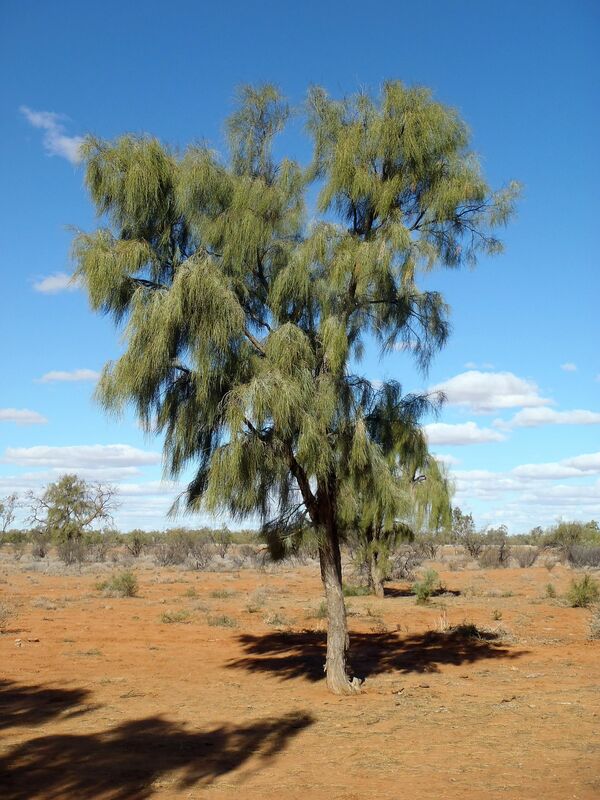 We had wanted to head for Alice Springs but the weather forecast for the next week is heavily overcast with some rain. In addition, the camel tour Annette wanted to take was fully booked through the week-end. We will hit Alice the next time we visit Australia. 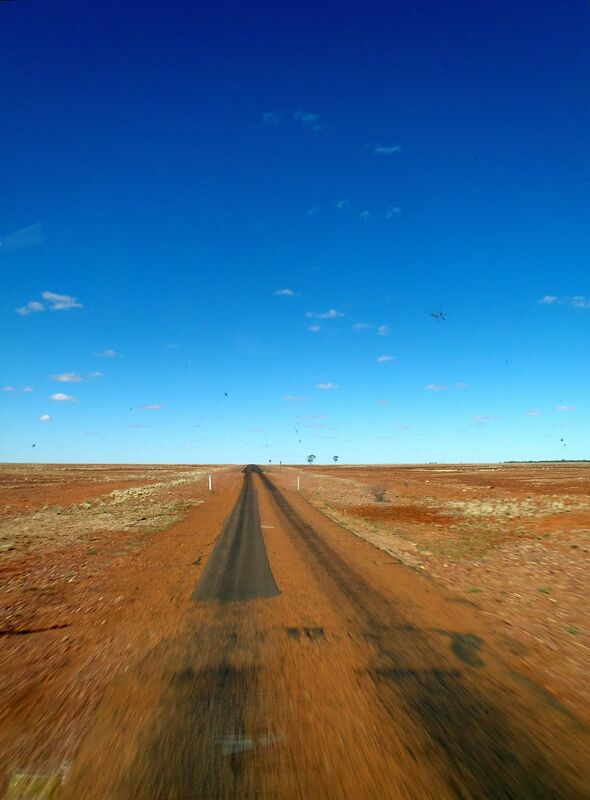 Instead, we backtracked north to the Barkly Highway, turning eastbound for Mount Isa in Queensland. This highway was arrow straight and behind us were brooding dark clouds, whilst we soon emerged into blue skies and sunshine. The day’s excitement was passing two camels on the roadside and I braked to a halt so that Annette could get pictures. Not the same as a camel ride maybe but cheaper. We halted for the night at a roadside rest stop named after the nearby station “Alice Downs”. The latter is some 68 kilometers inside the Northern Territory / Queensland border and boasts a police station. There is nothing else here. A bridge over the completely dry James river, a highway rest stop and directly opposite, the police station – most odd. At least we felt safe camping here and didn’t bother deploying the razor wire and Claymores. As we crossed the Queensland border, we stopped at a signed “WW II monument”. It turned out to be a section of tarmacked road, that had been laid down in 1943. 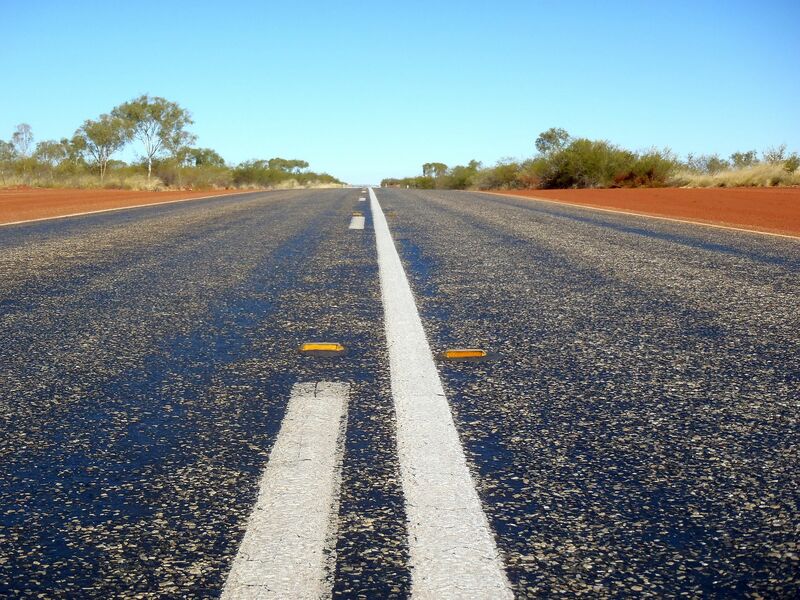 The graded highway was hurriedly constructed in 1942, following the Japanese attacks on Darwin and this road connected Australia’s east coast ports into Darwin’s main supply route, the north-south Stuart highway, at Tennant Creek. The section of WW ll highway had been tarmacked to a width of 16 feet in 1943 and supposedly the highway carried up to 1,000 trucks per day, a far cry from today’s occasional vehicle. 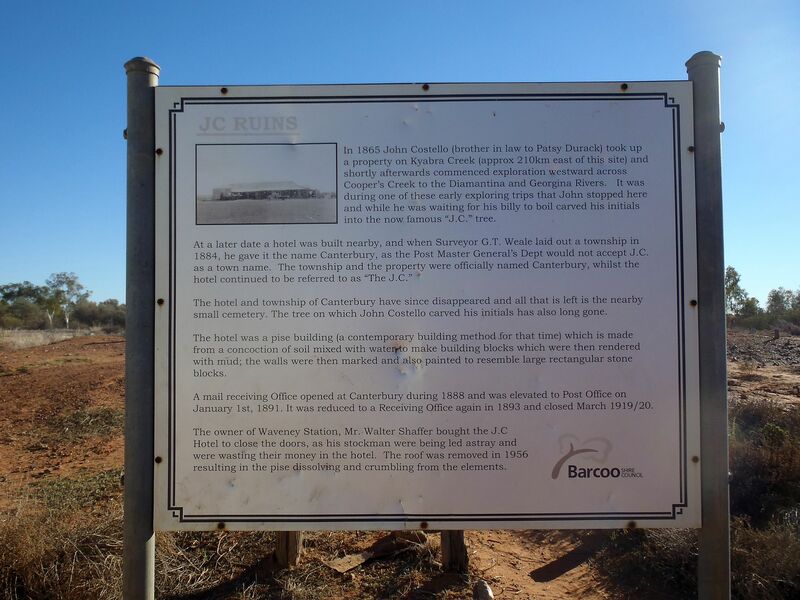 In fact if you got rid of the caravans, you could probably hold a picnic in the middle of the Barkly highway. I was a little puzzled as to why the highway was tarmacked in 1943, since the Japanese advance had already been stopped in June 1942 by the Battle of Midway. In August of that year the first Marine assaults in the Solomons were taking place and by November, the Australian troops had defeated the invasion attempt down the Kokoda trail in New Guinea, leaving the war far to the north. Nevertheless, we thanked their Herculean efforts as this was an “easy driving” highway. 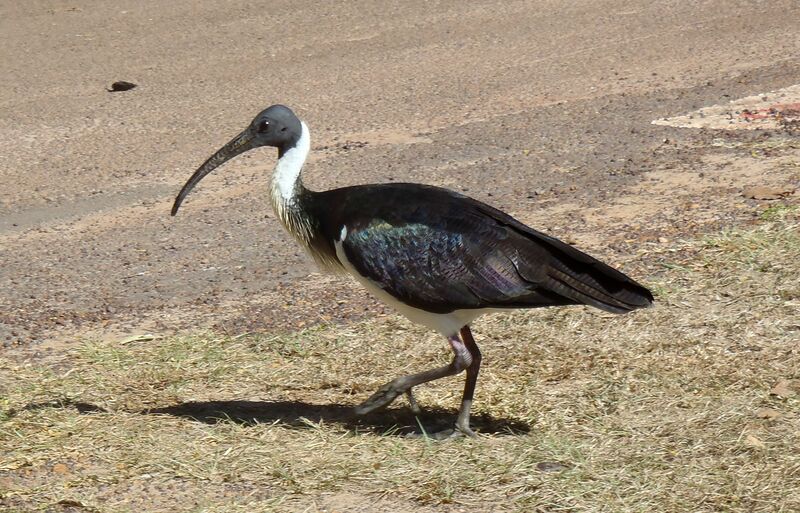 Our passage of the border into Queensland was like throwing a kill-switch with the quantity of road kill shooting up. 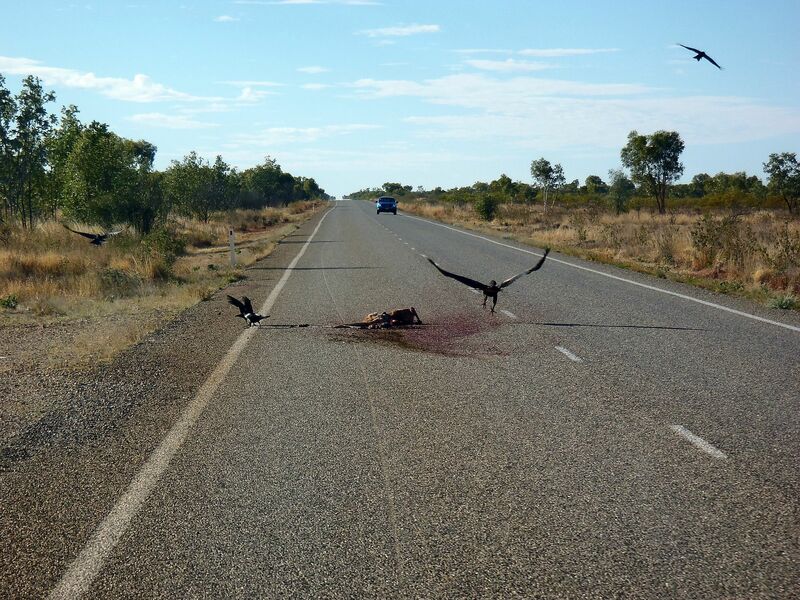 We saw scores of dead kangaroos being munched on by Kites and huge, black, Wedge Tail eagles that stand nearly a meter tall (three feet) and glower at you as you drive up, daring you to interfere with their breakfast. With such light traffic, we found it easier to drive around the eagles, rather than have the front end of the bus bitten off. We saw a large feral and very dead pig in the middle of the road as well as feral cats. 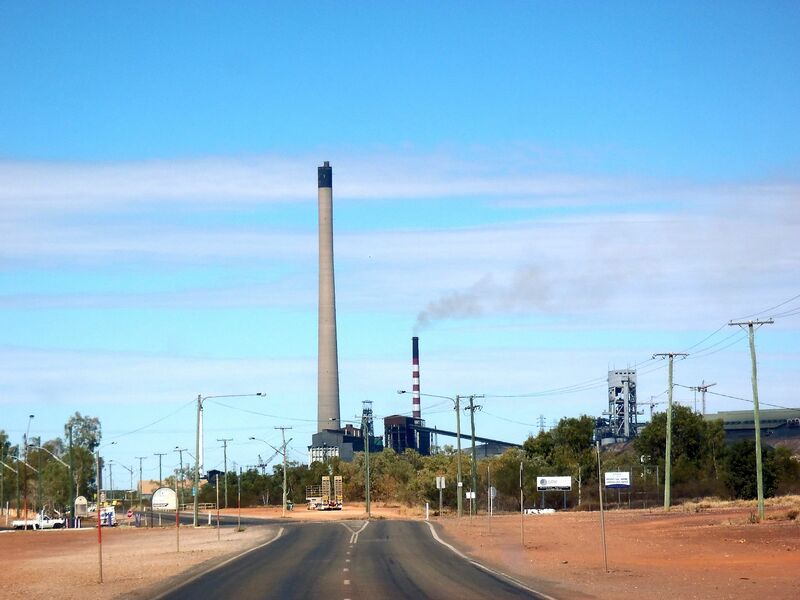 Approaching Mount Isa we saw all sorts of mining operations, presumably still extracting the lead, silver, copper and zinc that the area is famous for. The information center offered a tour of a “simulated” mine at $100 for the pair of us but were fully booked through Monday. 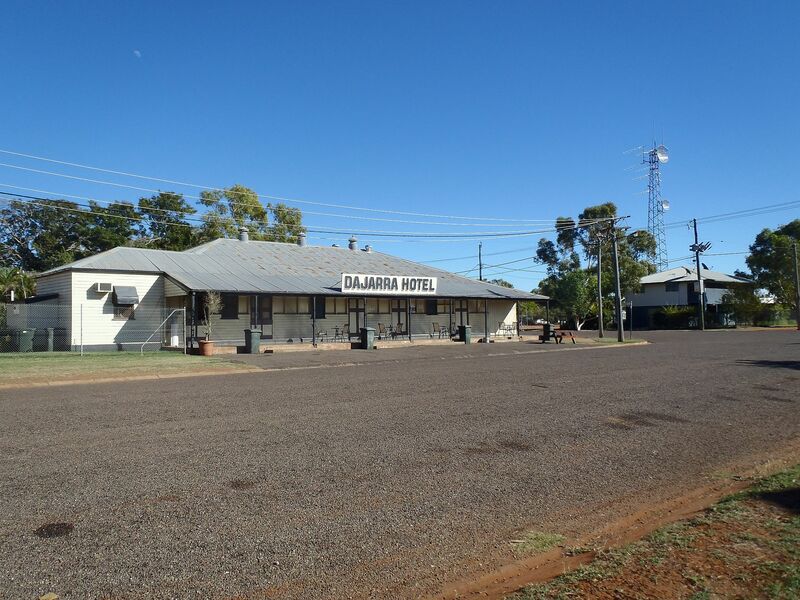 We moved on, driving south to Dajarra (population less than 200). 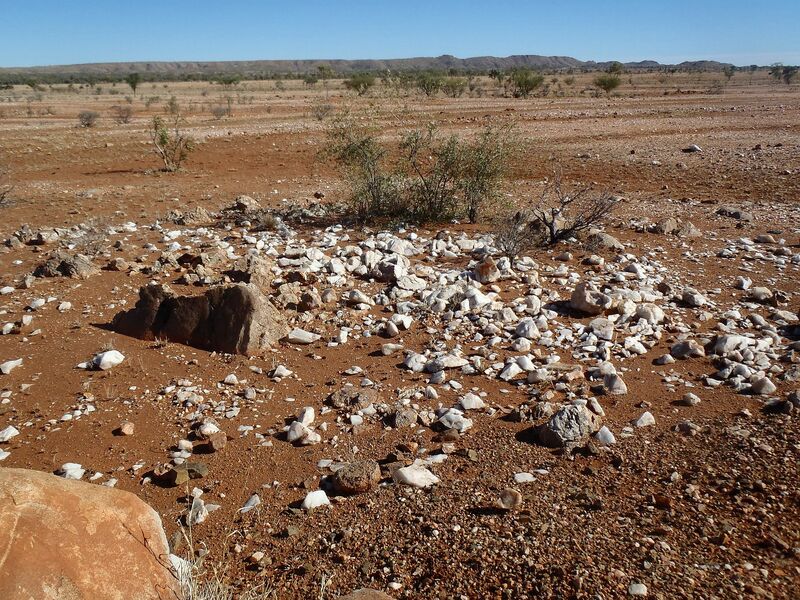 Dajarra had supposedly once been a railhead for shipping cattle but as yet we have seen no sign of a railway. We pulled into the only pub in town and paid the little Swedish girl behind the bar $5 for the use of the caravan park (she has been working here for 3 weeks). $5 extra for electricity and no receipt – it’s sorta casual here! We disconnected the park sprinkler system in order to fill our water tank and settled in for the night. We continued our journey south, stopping for lunch at the town of Boulia. We stopped at the information center to see if we could glean some information about the Diamantina road to our south. 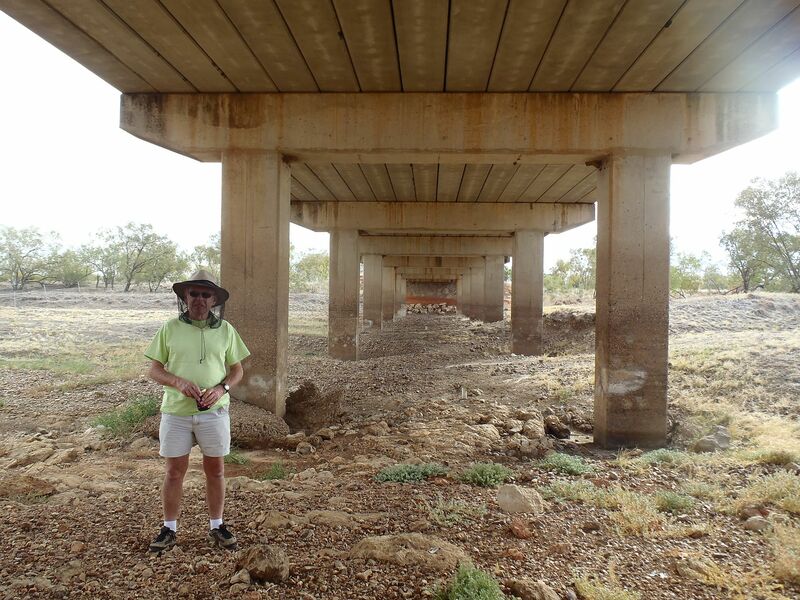 This is 250 kms or so of unsurfaced road, that crosses three river systems from Bedourie, east to the town of Windorah. We would like to take this route but are concerned that the river crossings might be soft sand and beyond our two-wheel drive capability. I had researched this last night on www.exploreoz.com but the latest report was that the road was “good”. For what? Hovercraft? The lady at the information center convinced us to watch a 45 minute sound and light show on the “Min Min” lights. The tale was told by animatronic dummies and the first 20 minutes was fun. The balance of the show was a let-down and we wondered if part of the display had broken down, as we had lots of eerie music but nothing else happening. The Min Min lights are a phenomenon of mysterious flying lights that have been observed by folks without the least semblance of credibility. Roswell, New Mexico at least has a hangar at “area 51” where we store our flying saucers..... 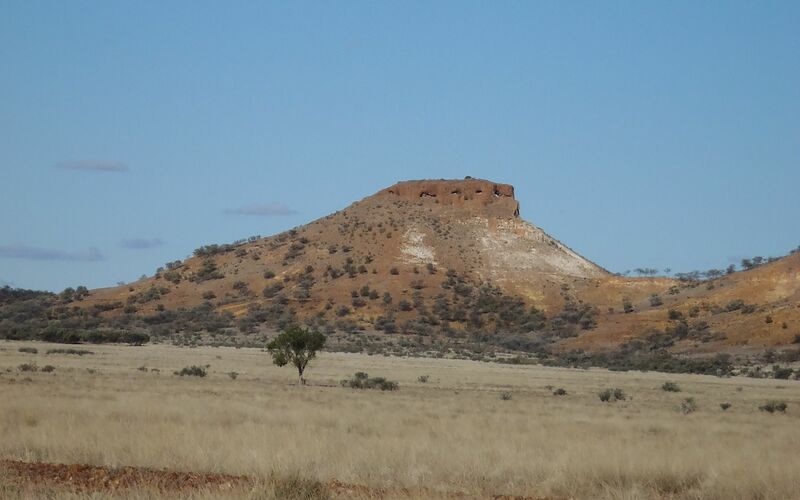 Nevertheless, we did however decide to attempt the passage of the Diamantina road and thus continued our journey south on single lane road towards Bedourie, keeping a sharp look-out for the Min-Min’s. This was a very pleasant drive with few other vehicles and we pulled completely off the track for the couple of road trains that we encountered. We stopped so that Annette could photograph a large feral road-kill pig, as well as another 8 very alive emus that ran at our approach. We stopped for the night at a turn off that according to my map lies just about on the Tropic of Capricorn. There was a large sign at our pull off detailing the heroic efforts of a local 1939 era postman but unfortunately, the sign was so sun-bleached, it was near impossible to read. A couple of vehicles passed our camp just before sunset but the road remained completely untraveled until the following sunrise. Last night was cold! At least for us and shortly after first light, we continued south to the town of Bedourie. As we approached the outskirts of the habitation, we checked our cell-phone and noted that there was no service. There was a gas station however and we topped up with diesel and also filled a spare 20 liter can. Although it is only 400 kms. 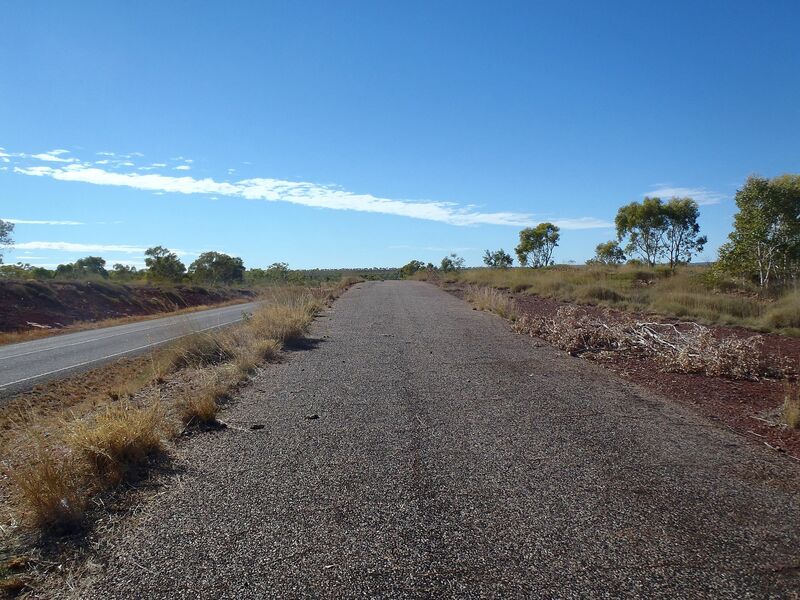 to the town of Windorah, some 250 kms are on unsurfaced roads. Headwinds, soft sand or corrugated road surface, could drastically increase our fuel consumption and it would be a very expensive place to be rescued from. The Bedourie information center provided some slow internet service for $2.50 per half hour and Annette was delighted to learn about the “Bedourie camp oven”. This was an outback version of the “Dutch oven”. 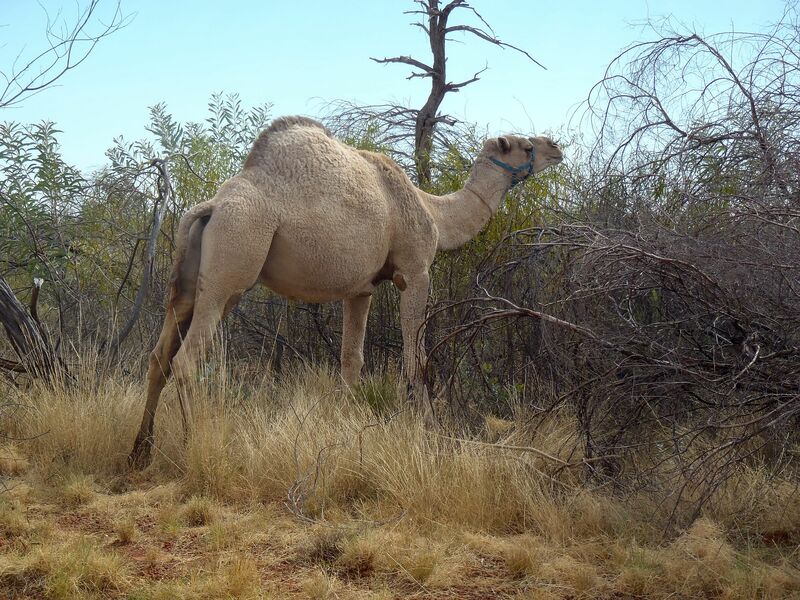 The latter are traditionally made from cast iron, found to be too easily broken and too heavy for outback use, particularly for cameleers hauling supplies by camel-train up the Birdville track. 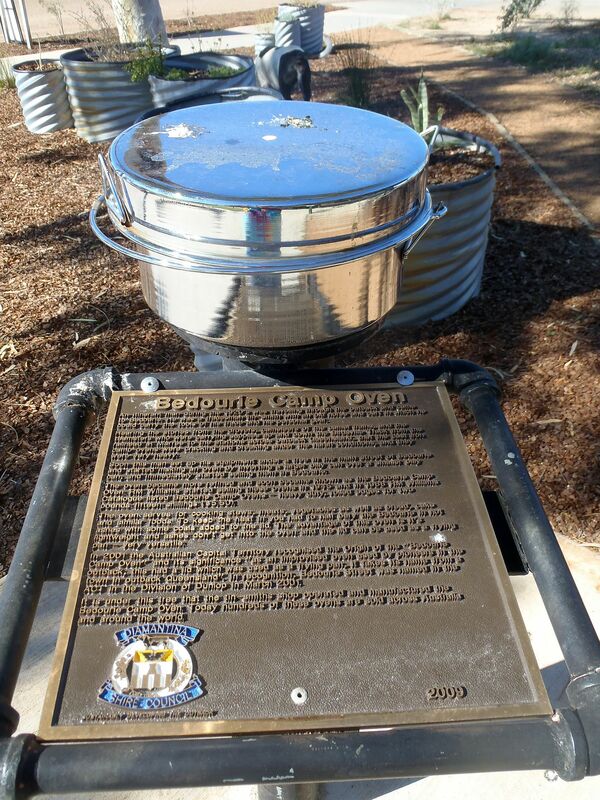 The Bedourie style oven was made from lighter material, “spun steel”. 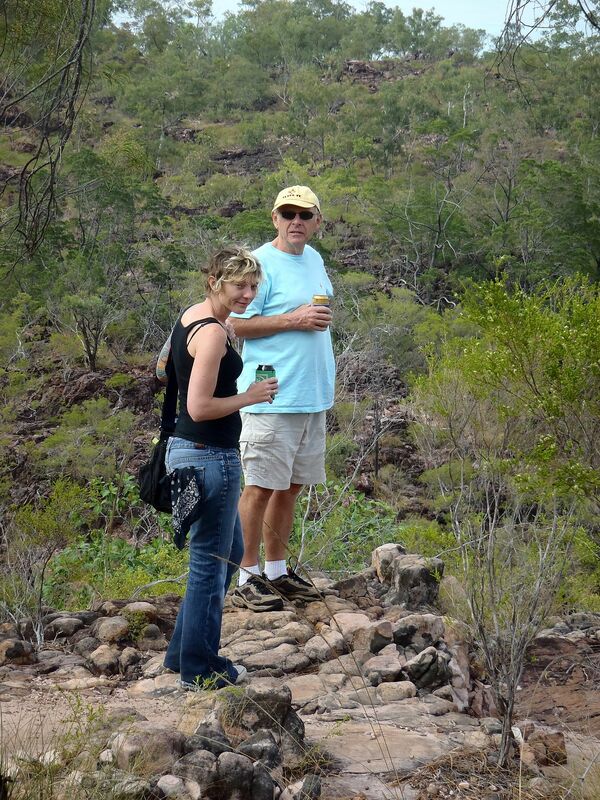 We headed out across the Diamantina road, so called because it crosses the headwaters of the Diamantina river systems. As soon as we arrived at the gravel, we stopped to apply masking tape around the rear door of the bus, in the hope that it would keep the dust from entering. The drive was awesome, a graded dirt track crossing an empty continent. Blue skies and sunshine, with a stiff crosswind that came straight from Antarctica and cut to the bone if you lingered too long to windward of the bus. 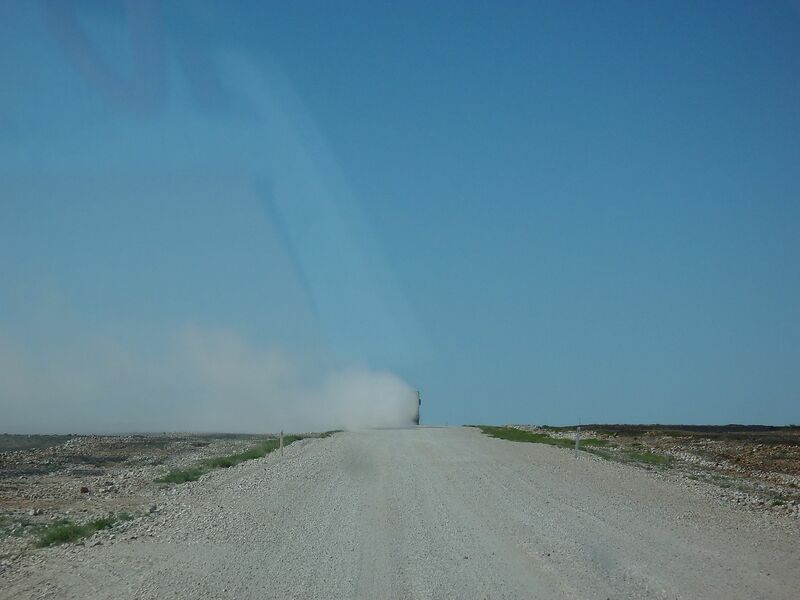 For the first half of the drive, we saw a couple of trucks heading for distant stations plus a road train hauling cattle coming the other direction but for the second half of the trail we were alone. 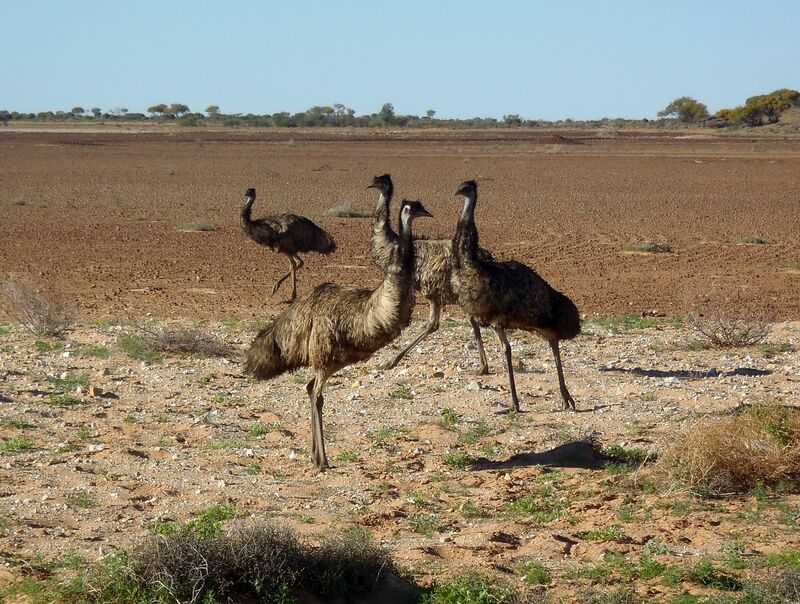 Annette was counting emu sightings but gave up after she got to 91. There were several flocks of over a dozen birds and if we stopped, a couple of birds would approach us cautiously to investigate what sort of beast we were. Annette tried to frisbee them bread from the bus window but the whole flock would tear off across the plains as soon as a slice of bread appeared. Perhaps they thought that it was a new shape of boomerang. 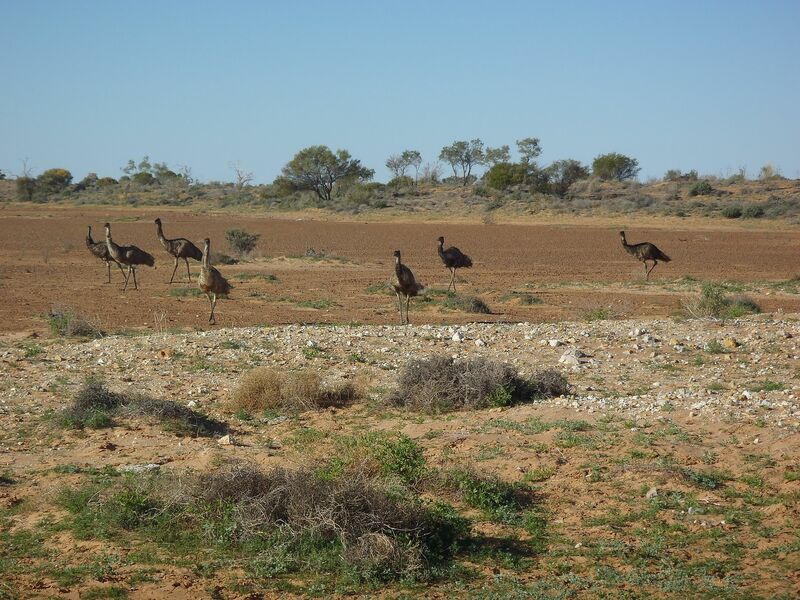 We saw a flock of eight or so Bustards that looked just like “baby emus”, that is until they take flight! 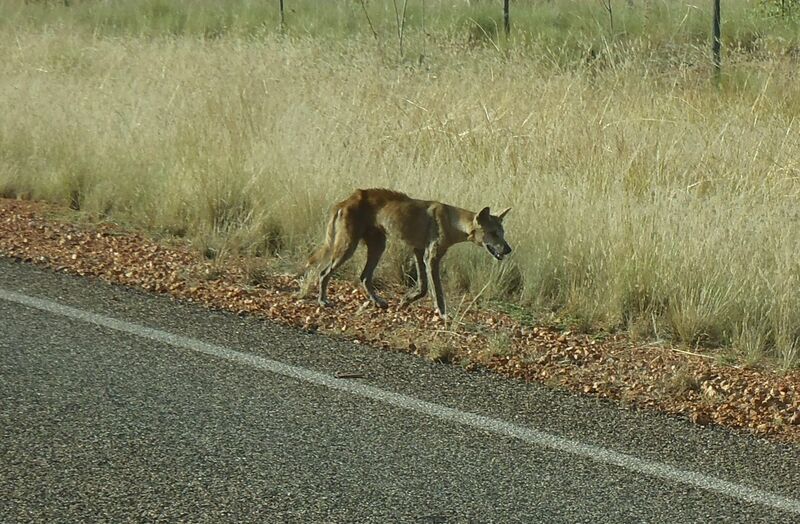 There were kangaroos, feral cats, feral pigs, horses, goats, lots of cattle, eagles by the score eating the ample road kill and the latter included a couple of feral pigs. We stopped for night at the ruins of the JC Hotel (25º 22' 40.26" S 141º 53' 56.46" E). This hotel had been named after a blazed tree where explorer John Costello had carved his initials. The hotel had gone broke and the pub was purchased by the owner of nearby Waveney Station, in order to remove this temptation from his stockmen. He removed the roof in 1956 and the elements have done the rest. All that remained were a few timbers and a mound where the walls had been. As we pulled off the highway, we met fellow travelers Mike and Barb from Victoria. Mike is dairy farmer on walkabout and invited us to share their cooking fire to cook our “tea”. We had just finished eating the last of our the “wahoo” we had been gifted in Exmouth but joined them nonetheless for sundowners. This was a fun evening, sitting around a campfire under the stars and yarning with new found friends.